Hello again! 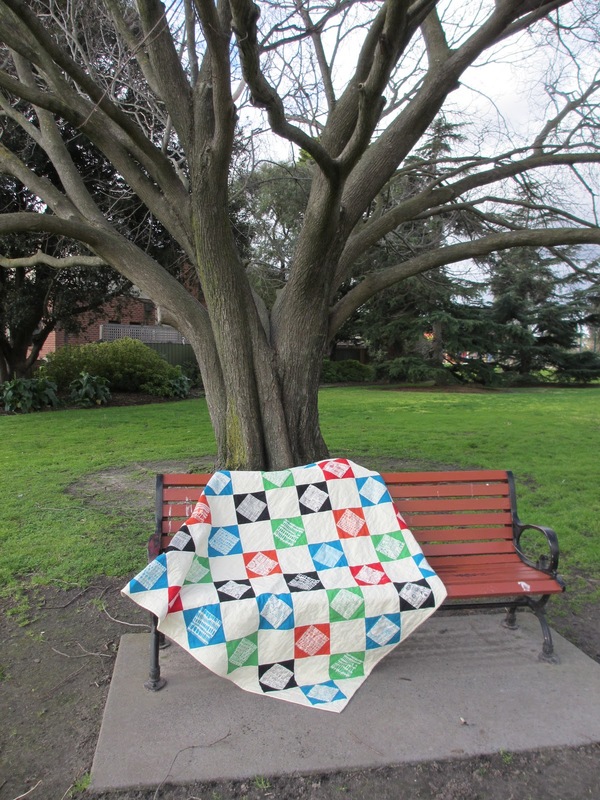 This is Karin Vail from Cascade Quilts and I am happy to bring you my third Moda Bake Shop project! This would look wonderul in just about any Moda collection! I showed a preview picture of the pattern to a quilter friend of mine, and she said it looked like a labyrinth or maze, so the name was born. This quilt came together pretty quickly – it looks complicated, but if you keep your consistent 1/4” seam, you should have no problems 🙂 This quilt top finishes at approx. 87”x87”. We will be using 1/4” seam allowance throughout. First, we’ll be cutting loads and loads of narrow strips from your Bella solid. Set aside 30 WOF @ 1.5” for your strip sets, and 8 WOF @ 1.5” for your sashing. To get the most out of your solids, you can get two 16.5” pieces and one 8” piece from each WOF – so, from 22 strips, cut 44 pieces @ 16.5” and 22 pieces @ 8” – then from one strip, cut 1 piece @ 16.5” and 3 pieces @ 8” – then from 5 strips, cut 25 more pieces @ 8”. This should give you the least amount of waste. 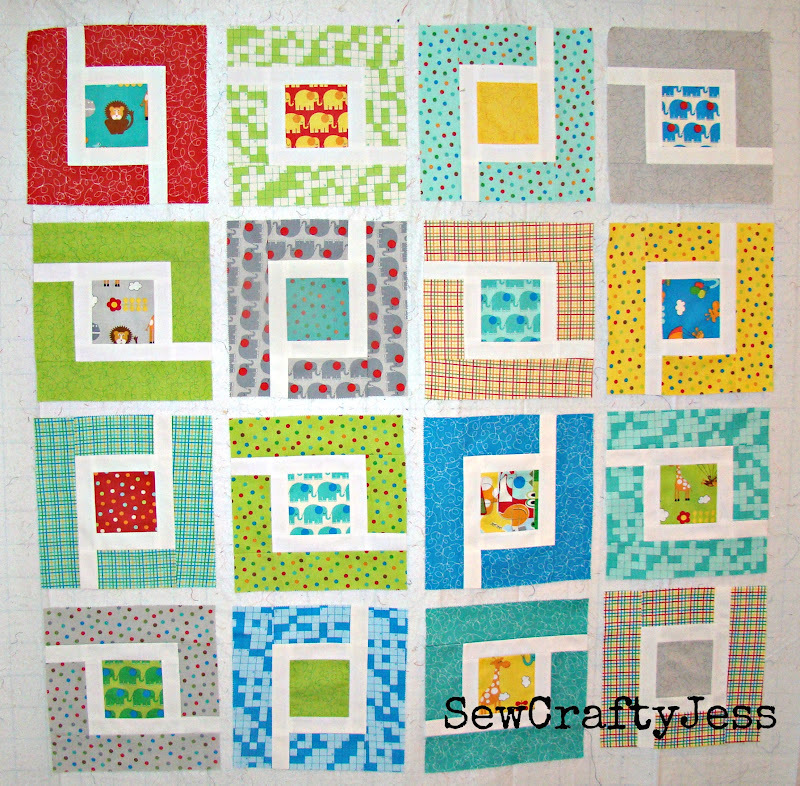 Join the eight WOF 1.75” strips into 4 @ 88” for your border. 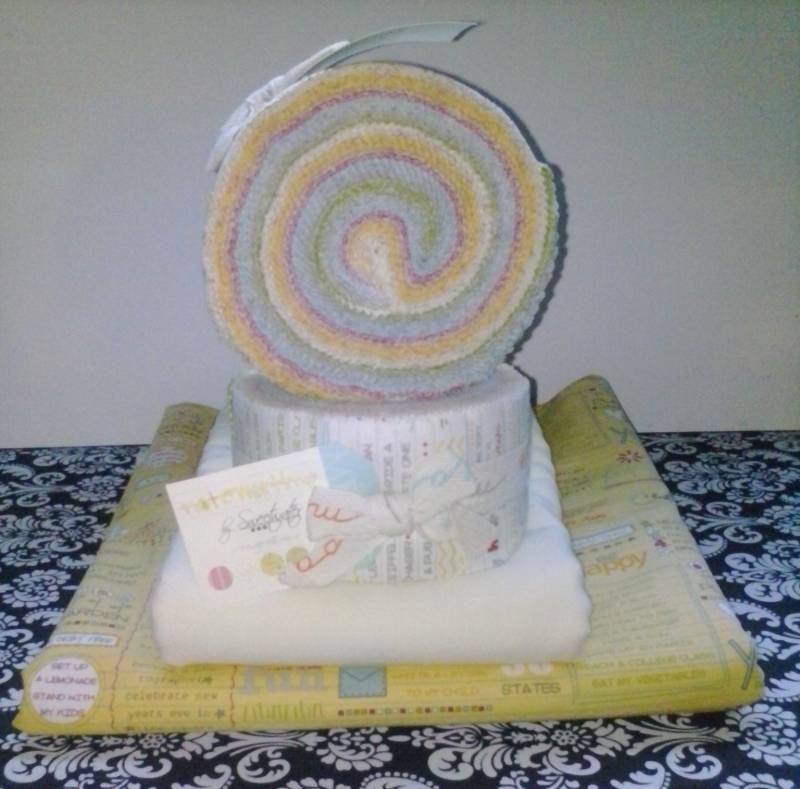 Open your two jelly rolls and choose 30 strips from each jelly roll for a total of 60 strips. 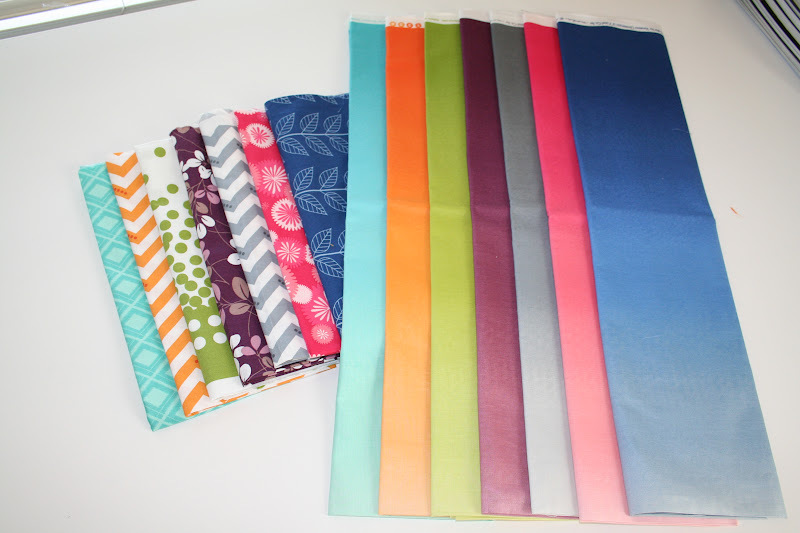 Some of the remaining jelly roll strips will be used for scrappy binding, so keep that in mind when choosing strips. Also keep in mind what you choose if you might want to make matching pillows. Unfortunately, I left out the white/white prints and lower value prints and didn’t think about using the remaining for pillows until the top was already all assembled. I wish I would have thought ahead further so I could have a matching pillow or two. 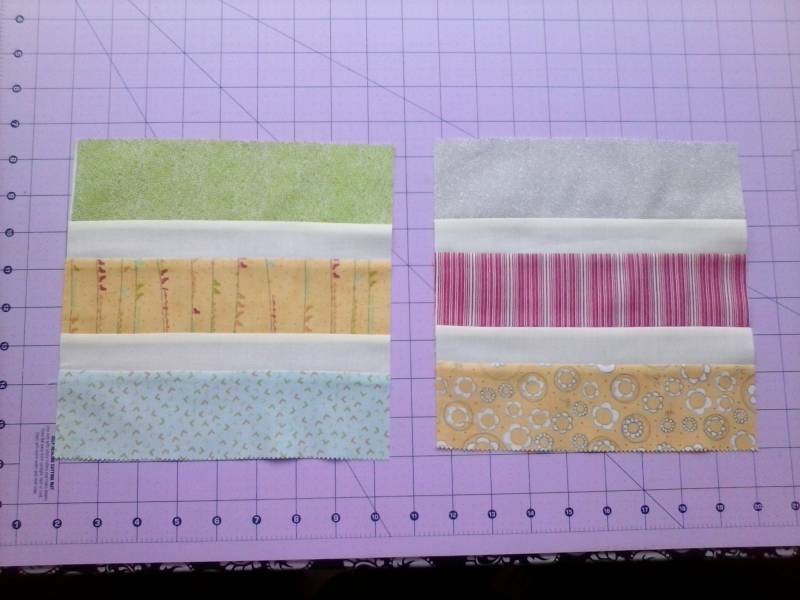 Anyhow, for each of the strip sets, you will choose 3 jelly roll strips and join together alternating with 2 of the 1.5” solid strips. Press all seams to one side. 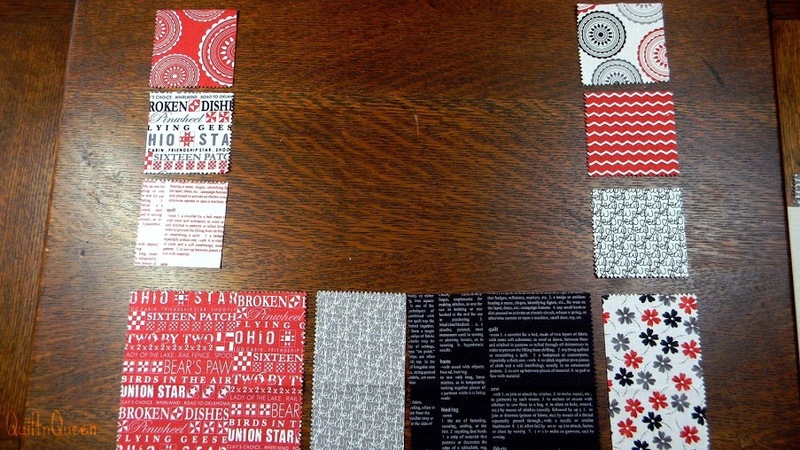 You will sew together 20 of these strips sets. Each strip set should measure 8.5” wide. Cut each strip set into five 8.5” squares. There will be VERY LITTLE waste here, so cut cautiously. 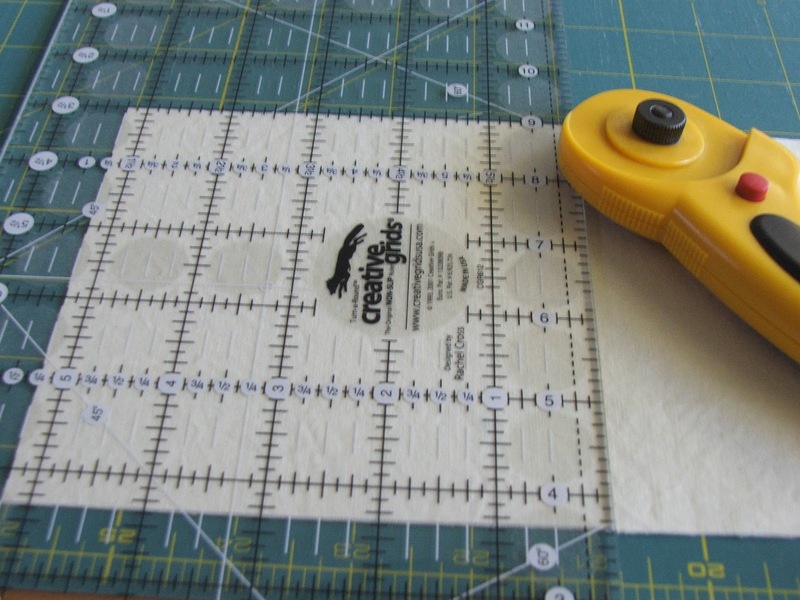 After you have cut all your strip sets into 8.5” squares, you will take pairs keeping the seams orientated in the same direction, and cut them diagonally in opposing directions. It is imperitive that you cut the angles in opposing directions for this to work. Now, swap the upper pieces from each block and align and you will start to see the sub-block emerging! If you pressed the seams to one side, and kept them in the same direction when you cut the blocks, your seams will all nest pefectly when you go to join the triangles back into a square! 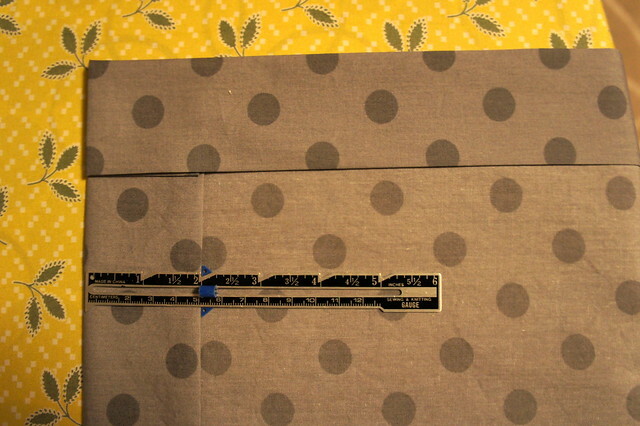 The bias edge helps a LOT to make sure your seams line up. 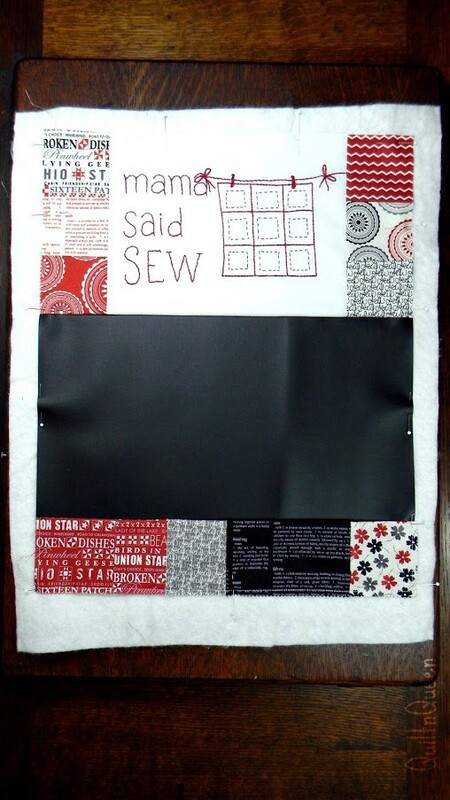 Continue cutting/sewing your sub-blocks – you should have a total of 100 for this quilt. 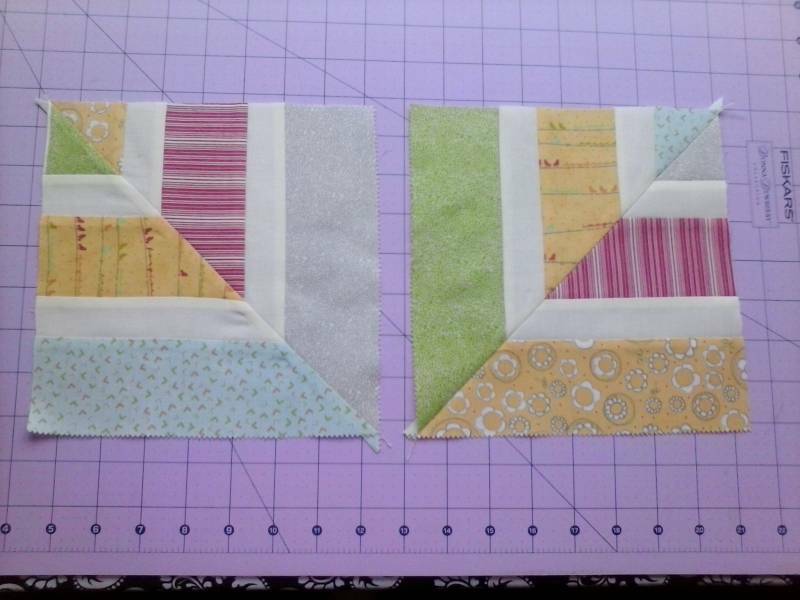 To assemble the 25 blocks, you will stitch an 8” x 1.5” solid between pairs of sub-blocks, press toward the solid. Then, assemble pairs of those with the 16.5” x 1.5” strip for your finished blocks. There will be 25 total. 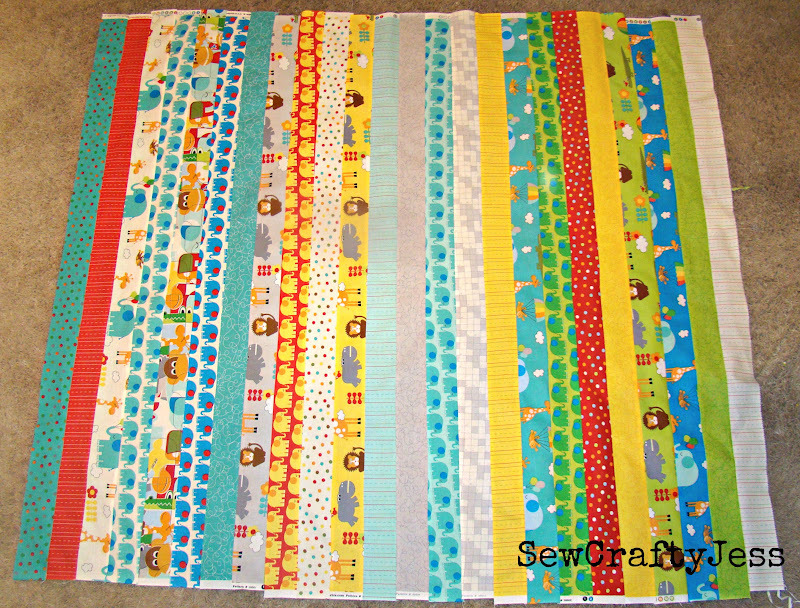 Using your final twenty 16.5” x 1.5” strips, sew the blocks into rows of 5 – then use your 1.5” x 88” strips to join your rows. 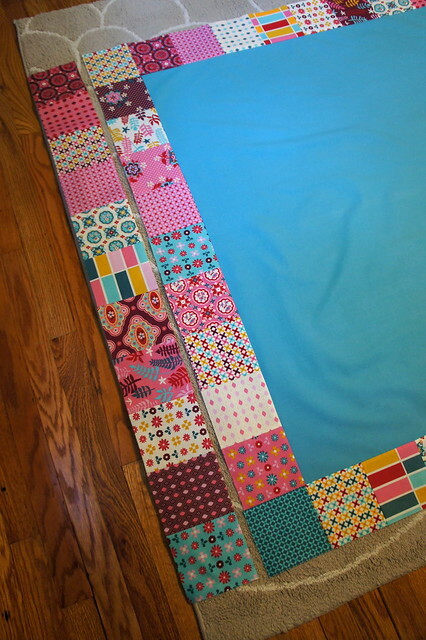 Finally, use your final four 1.75”x 88” strips to add a border for a final quilt top finish of 87”x87”. 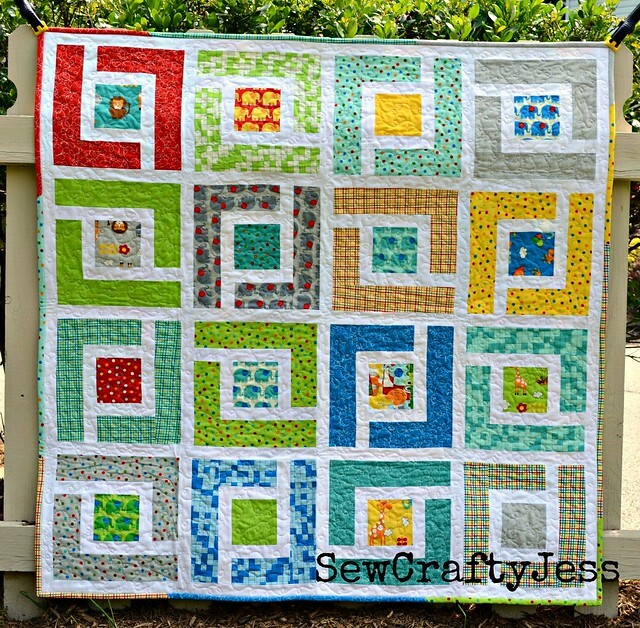 Hop on over to my website to see the quilt in it’s post-washed crinkly goodness! I wanted to do something festive for my dining room table, and I thought, hey! 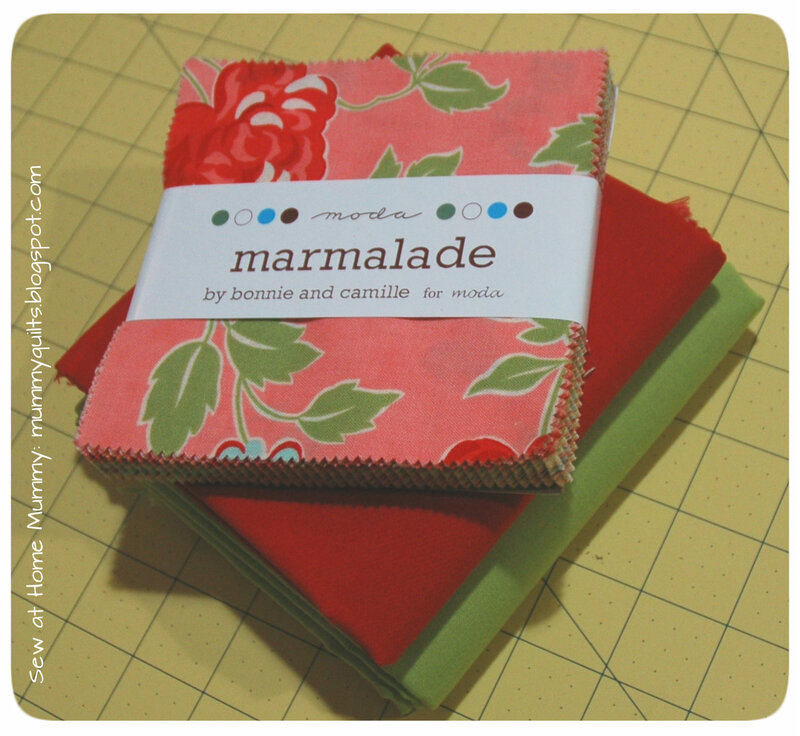 I love ‘marmalade’, why not pair it with a modern red & green to give the line a Christmas-y spin? I love the way it turned out – it looks good on my table for the upcoming holidays, yet I could most definitely pull it off year round! I had a lot of fun composing this runner and I have to say: don’t be scared of curved piecing! Look how gorgeous it looks when it’s done. This would make a fantastic holiday gift, too. 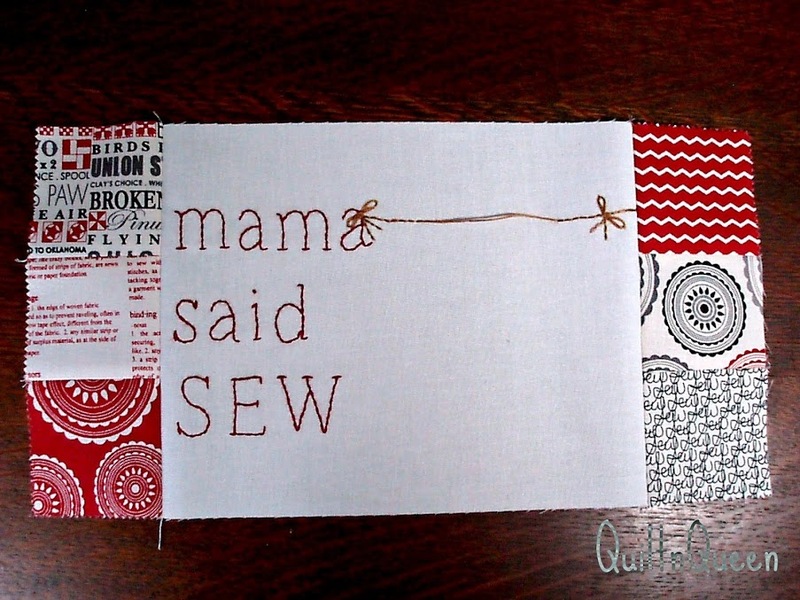 Happy sewing, quilting and crafting everyone! This is what you want – it’s the seam allowances that make it appear too big to fit. 1. Sort your A’s and B’s in combinations of fours (there will be 4 each of A’s and B’s in one block) ; I sorted by colorway in a way that was aesthetically pleasing to me. Have fun with it! 2. Attach piece (A)s to piece (B)s, creating quarter block units. If you have never pieced Drunkard’s blocks before, here are some tips. c. Match the two outside edges together; pin in the same manner as described above. 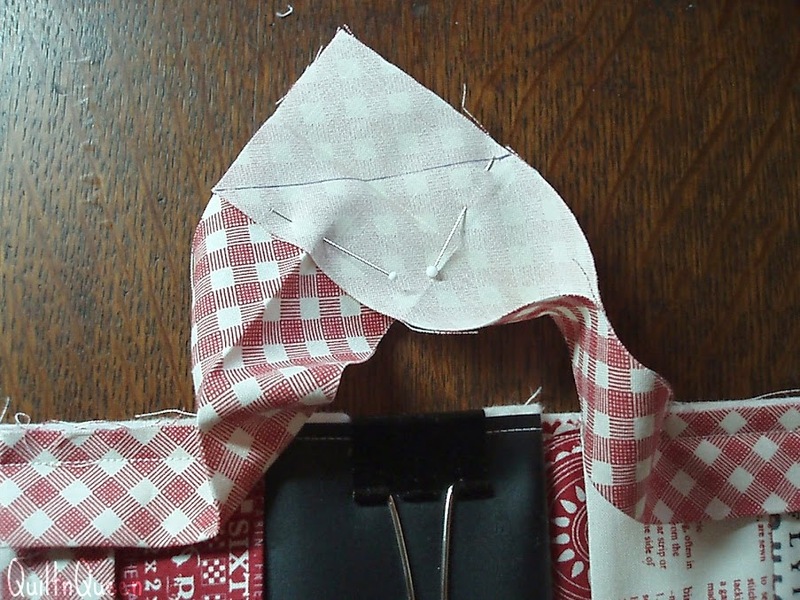 Place pins along the rest of the curve, easing the fabric to fit. ii. 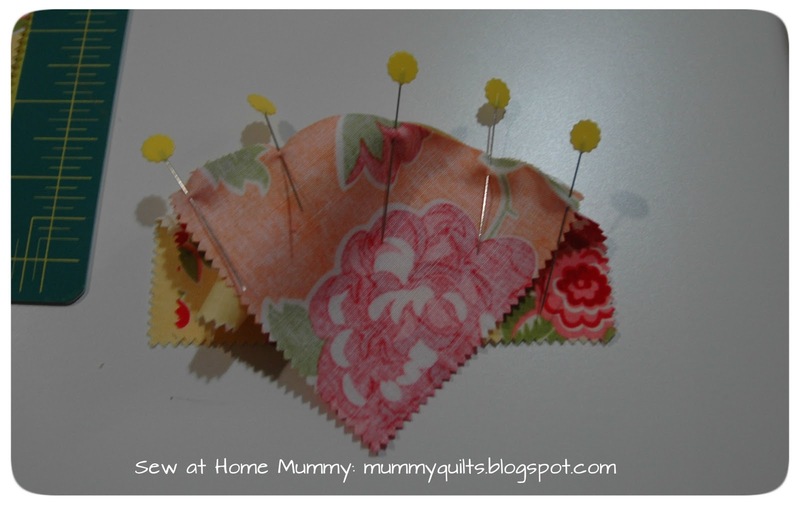 Leave your pins in to the last minute, without sewing over them. iii. every 3-5 stitches, lift your presser foot, pivot slightly, adjust your fabrics, etc. iv. always be conscious of the fabric about to enter under your presser foot – make sure there are no lumps and bumps. f. Press towards piece (A)s.
g. Join two quarter blocks to create a half block; press. Repeat with other half of block. Join two half block pieces, matching center seams. Press center seam open. 1. 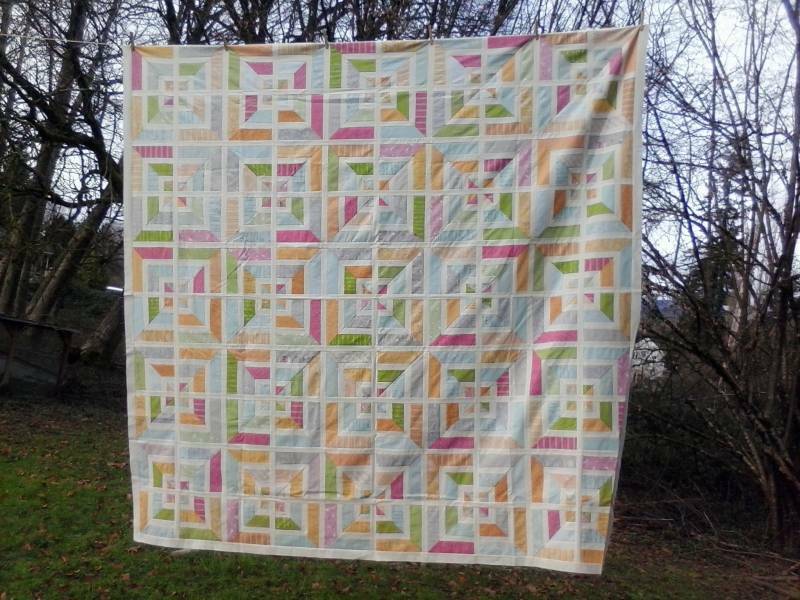 Sew short ends of the two 16”x30” pieces of ‘Pistachio’ together, creating a backing measuring 16”x60” with a ½” seam allowance. Press seam open. 2. Use remaining ‘Pistachio’ for binding (as desired). 1. Layer, baste and quilt as desired. 2. Bind as desired with remaining ‘Pistachio’. I used a decorative top-stitch on the binding seam to jazz it up a bit. 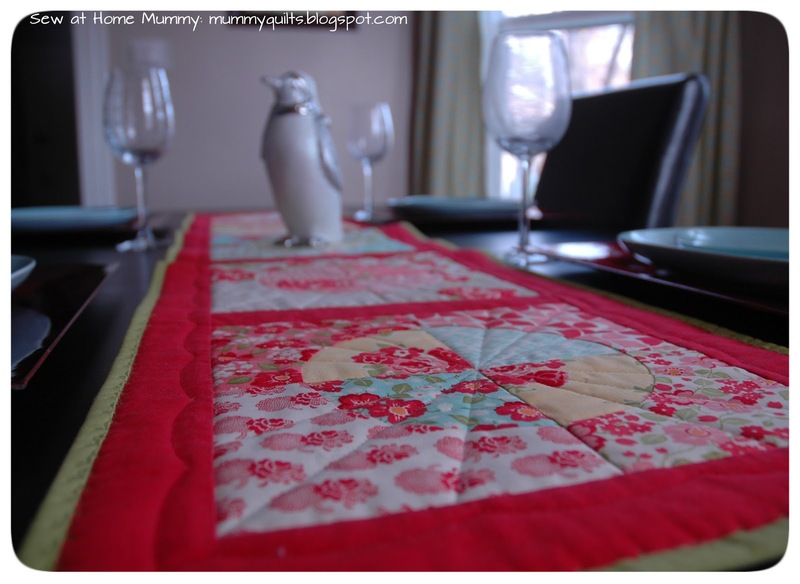 One gorgeous ‘marmalade’ table runner with a festive spin. If you have a minute, pop by my blog and see what shenanigans are brewing – there’s always something happening. 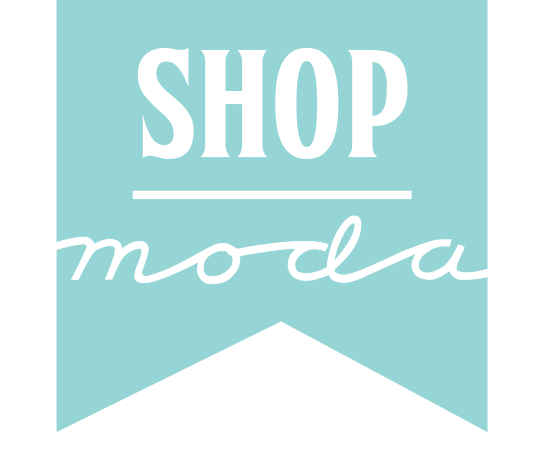 Big thanks to Moda for giving me the opportunity to work with their gorgeous fabrics again! Hello! I am excited to share my first Moda Bake Shop recipe with you as part of the ‘Just in Time Gifts’ series. 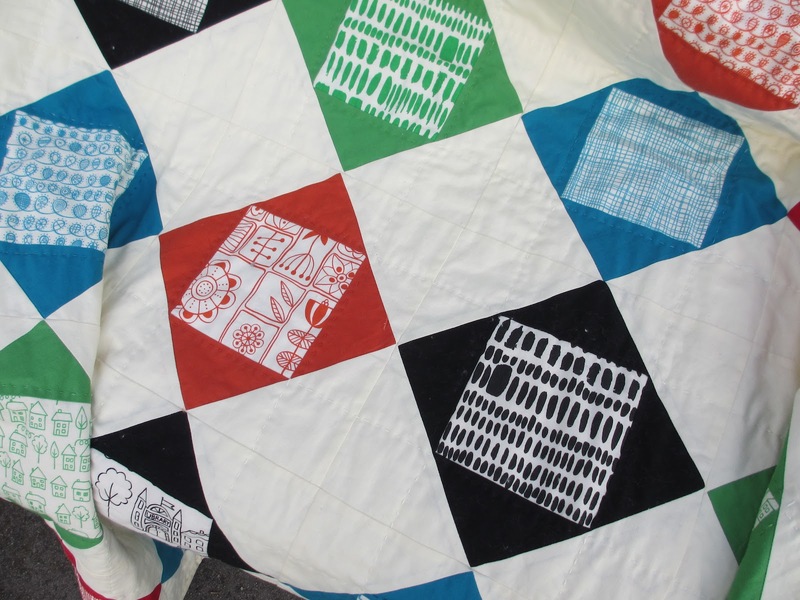 My name is Pauline Francis and I have been quilting for about 10 years. 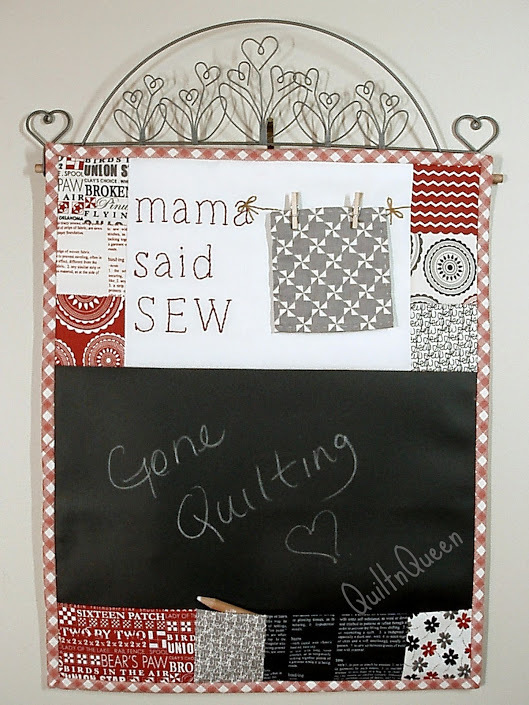 I blog at Quiltnqueen and I’d love for you to come for a visit. I hope you love the message board as much as I do. All seams are 1/4″ unless otherwise noted. Choose 11 different charm squares. 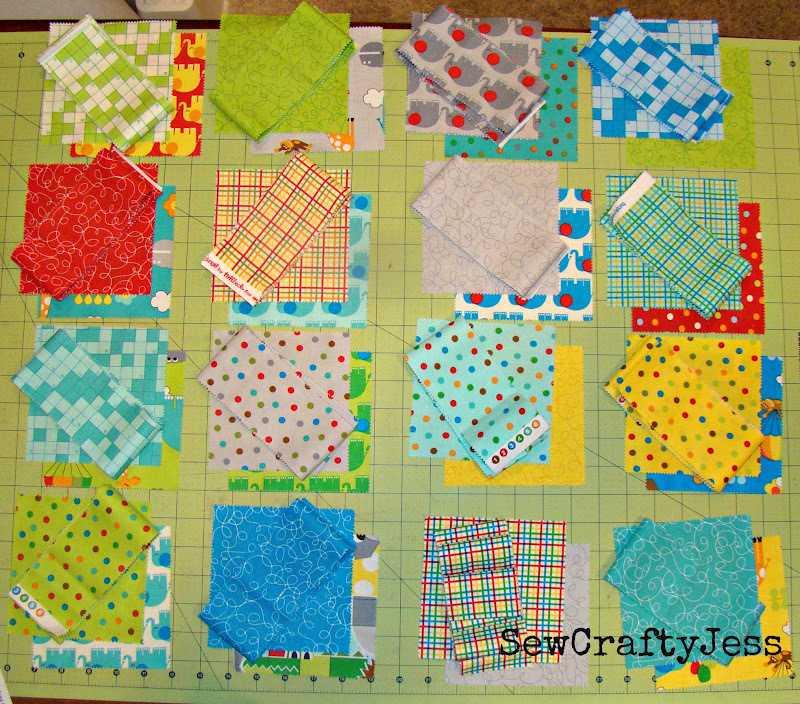 Cut 8 of the charm squares into 2 – 2 1/2″ squares and 1 – 2 1/2″ x 5″ rectangle. 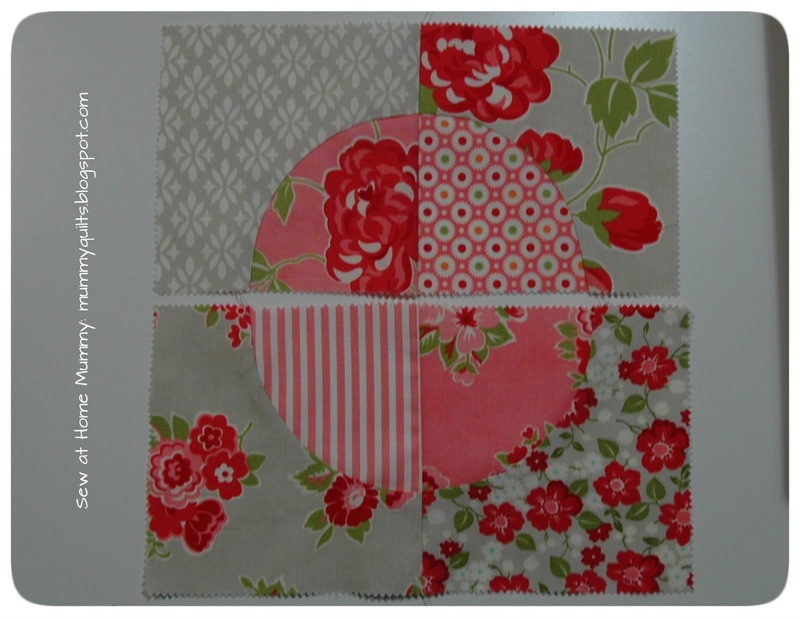 Choose 6 different 2 1/2″ squares for the header, 3 for the right side and 3 for the left side of the embroidered block. Choose 2 of the 2 1/2″ x 5″ rectangles and 2 of the 5″ charms for the bottom pocket. I have included 2 options for the header. See the Printer Friendly file at the bottom of the post for the template. Option A is all redwork embroidery. Trace the entire PDF file. Stitch with DMC #498. 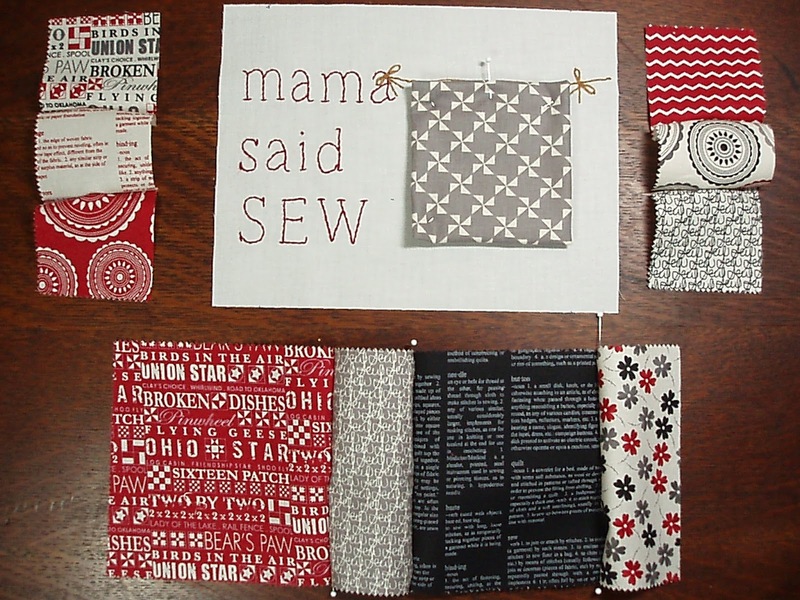 Option B is redwork embroidery with a mini quilt attached to the laundry line with mini clothes pins. 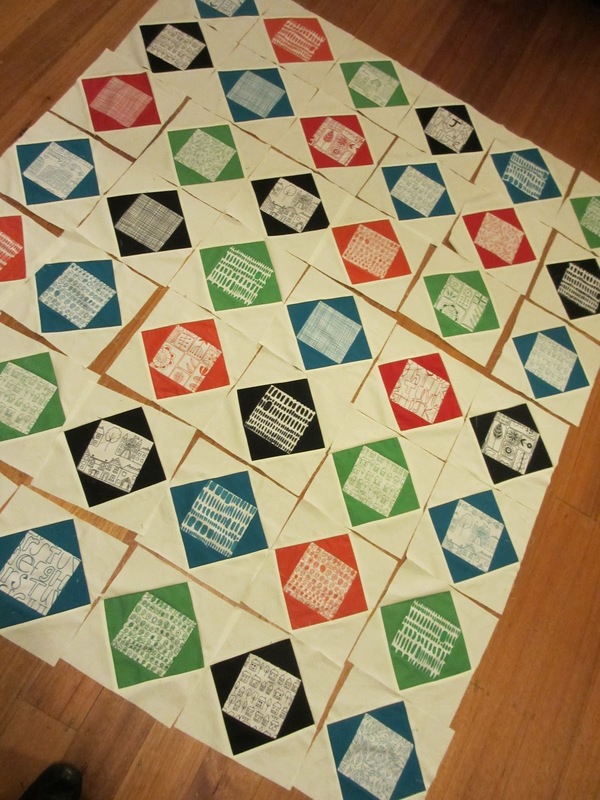 Trace the words and laundry line only, do not trace the quilt. Stitch the words with DMC #498 and the laundry line with DMC #420. 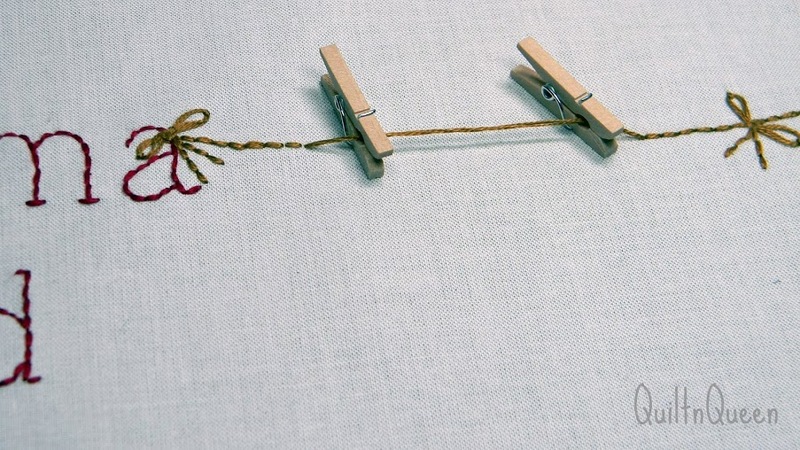 When stitching the laundry line use the back stitch 1 inch at each end of the laundry line. 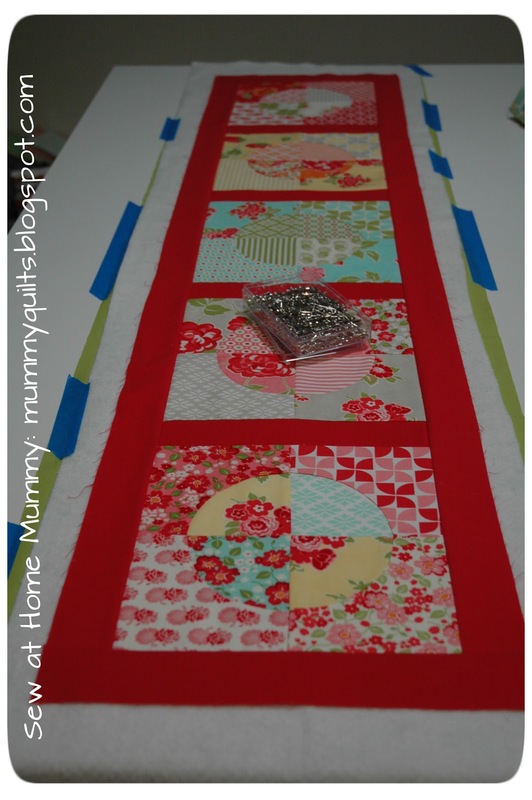 Leave 3 inches of the line unstitched to attach the mini quilt to the line. Whether you choose Option A or B, trim the embroidered piece to 8 1/2″ wide x 6 1/2″ long, centering the embroidery. 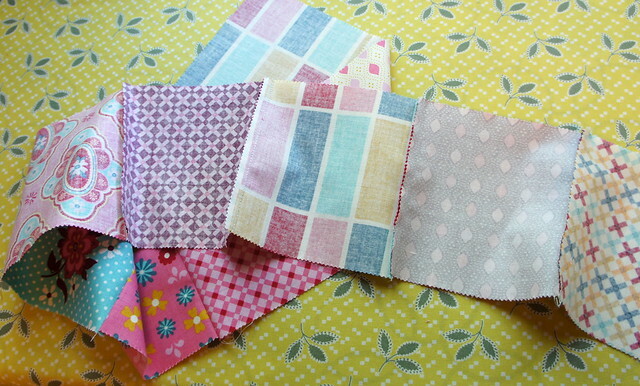 To make the mini quilt, take the last 5″ charm squares and a piece of batting 3 1/4″ wide x 3 1/2 ” length. Wrap charm square around the batting, mitering the corners. Hand stitch close to the edge and hand quilt the body of the quilt. 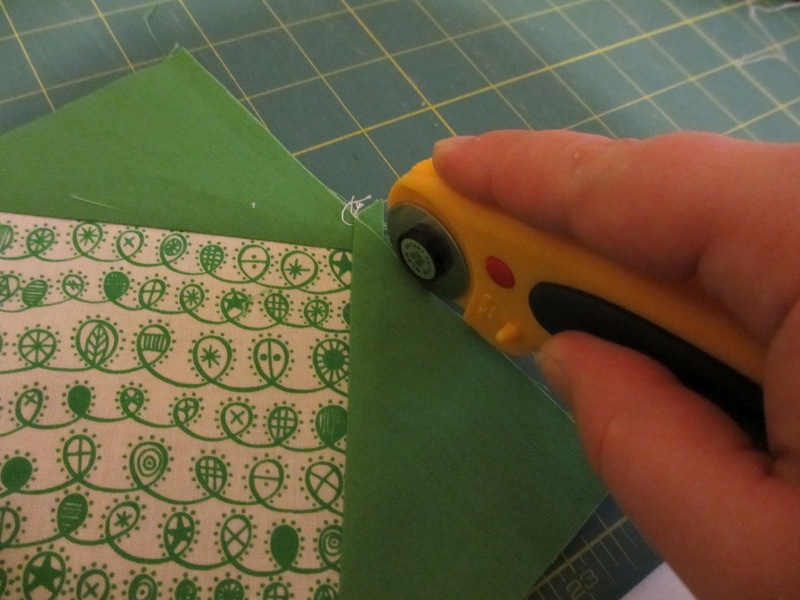 Press edges under 1/4″ around the rectangle you cut for the mini quilt backing and hand stitch to the back of the mini quilt, wrong sides together. I used my walking foot to assemble the entire message board. 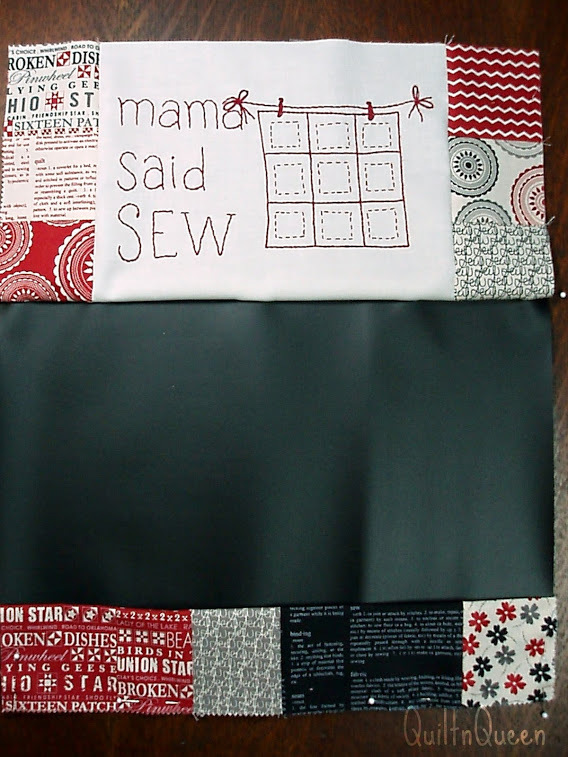 Sew 2 sets with 3 of the 2 1/2″ squares. Press seams open. The length should measure 6 1/2″. 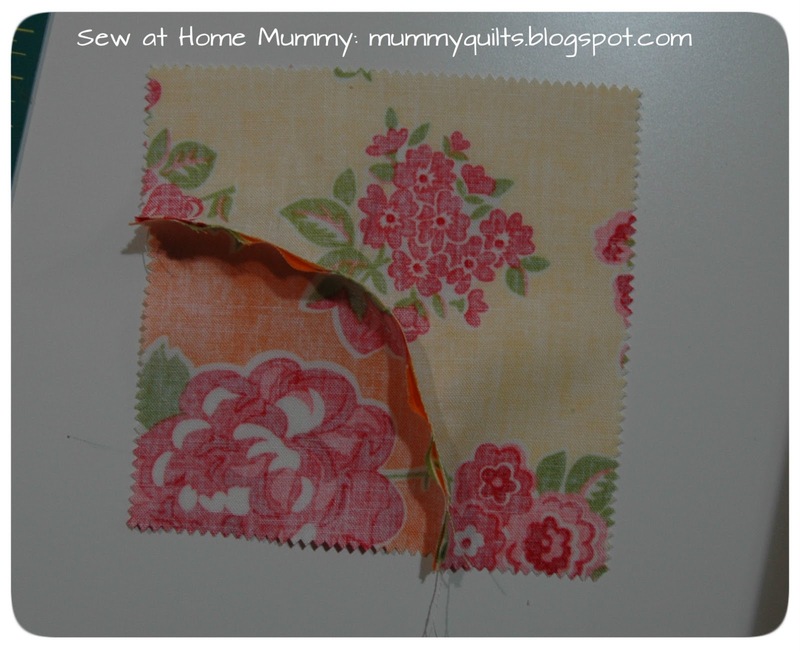 Sew the 2 sets of squares to the embroidery block, press seams towards the squares. 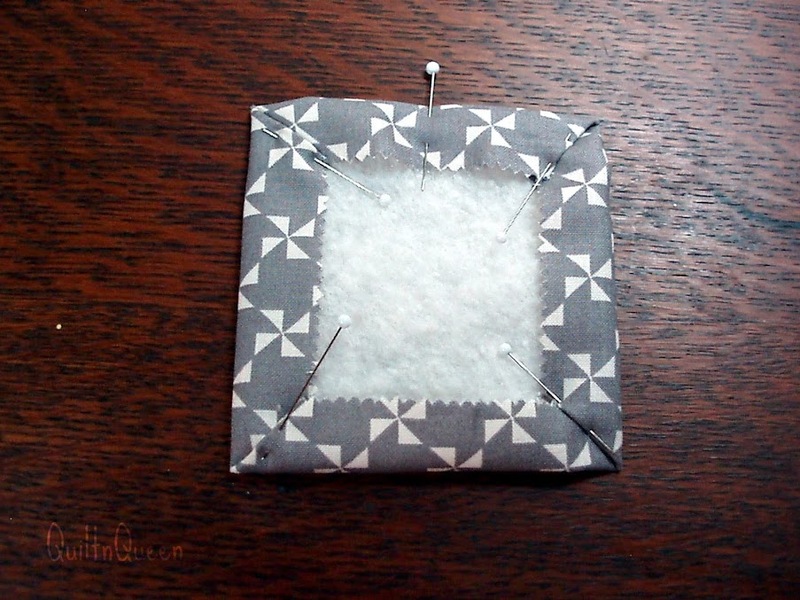 To make the pocket, trim 1/2″ off the side of the middle charm square. 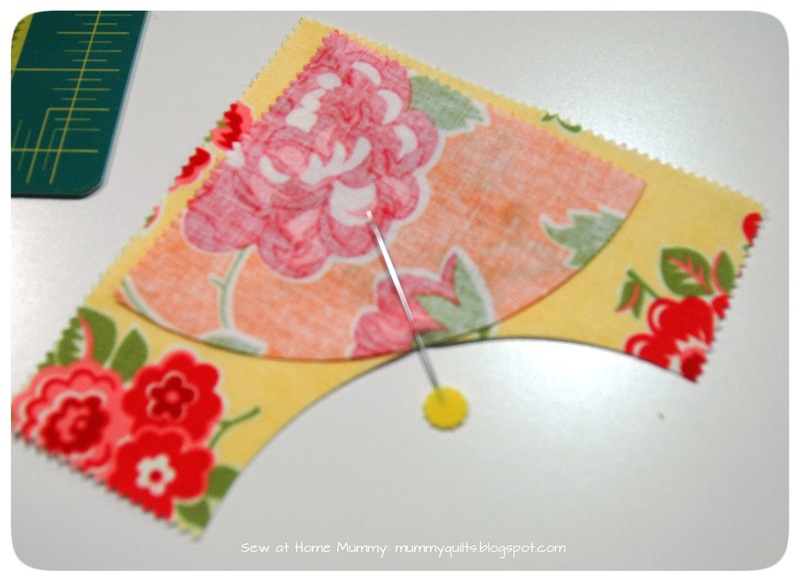 Sew the pocket pieces together, press seams open. 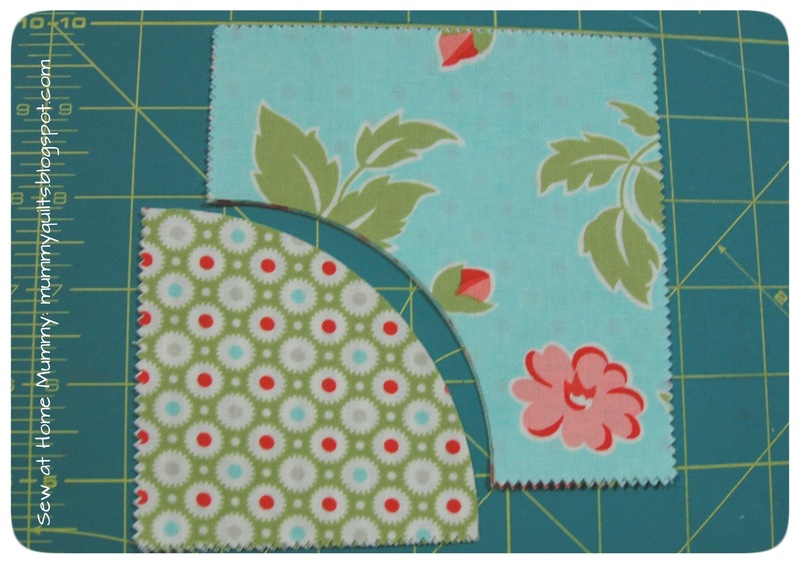 Trim to 12 1/2 ” cutting from the charm on the left…the pocket piece should measure 12 1/2″ x 5″. 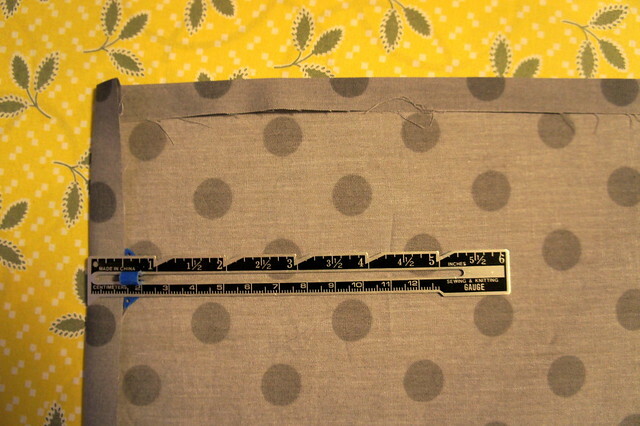 Fold the pocket piece in half lengthwise, press, it should now measure 12 1/2″ x 2 1/2″. 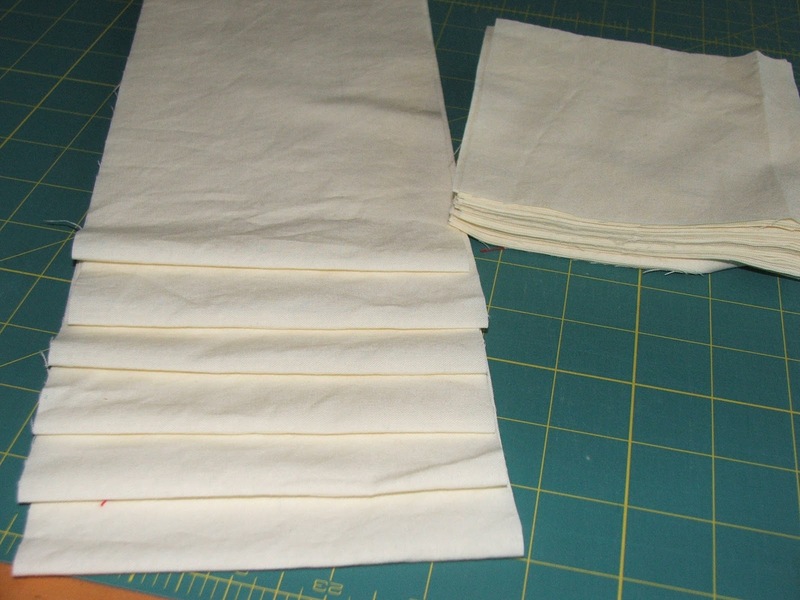 Sew the sides of the pocket and the bottom of the pocket to the chalk cloth, raw edges even, using 1/8″ seam allowance. 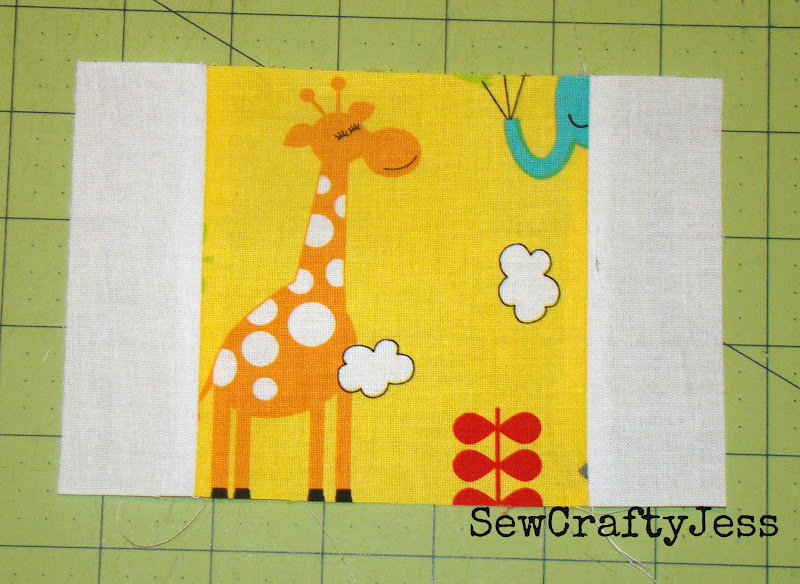 Sew the bottom of the header to the top of the chalk cloth (option A). Sandwich the top, batting and backing, stitch 1/8″ around the outer edge.Make one small pocket and one large pocket by stitching in the ditch…first seam on the left. 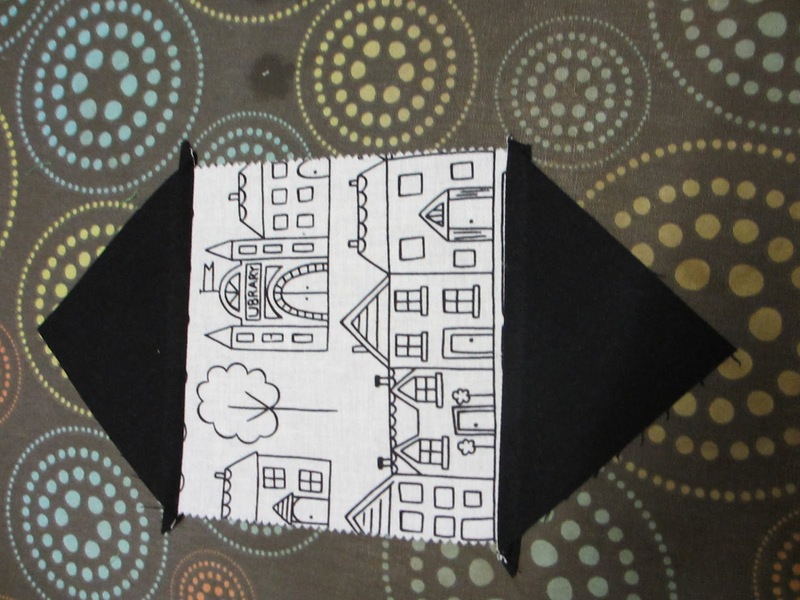 The larger pocket will hold your chalk pencil.Stitch in the ditch down the inside seams of the embroidered block or quilt squares as desired. Trim and bind using your favorite method. Attach a hanging sleeve using your favorite method. The message board finishes at approximately 12.5″ x 15.5″. If your local quilt shop does not carry the chalk cloth, ask them to order it from United Notions. I would love for you to visit my blog,where you will find more message board ideas. I hope you have fun making a message board for a gift and don’t forget to make one for yourself. It has been a lot of fun baking with Moda. 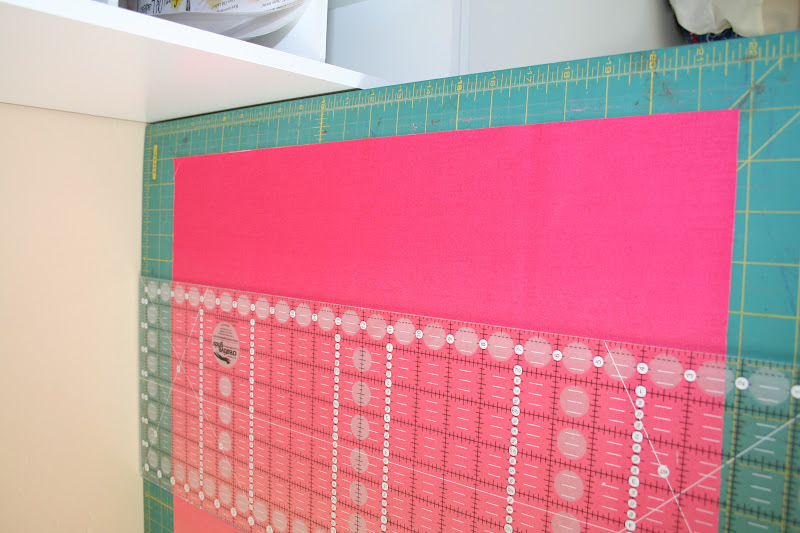 Press your 1/2 yard ombre fabric and lay out on your cutting mat horizontally. 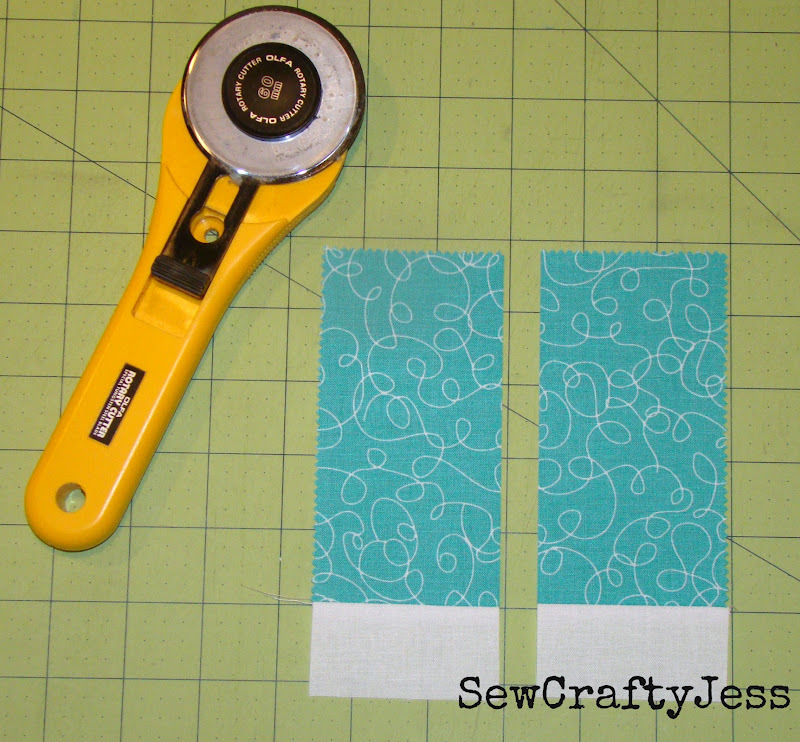 Trim the selvedge from the darkest end and cut a strip 4 3/4″ wide. Next find the lightest part of the fabric. It should be right on the fold. 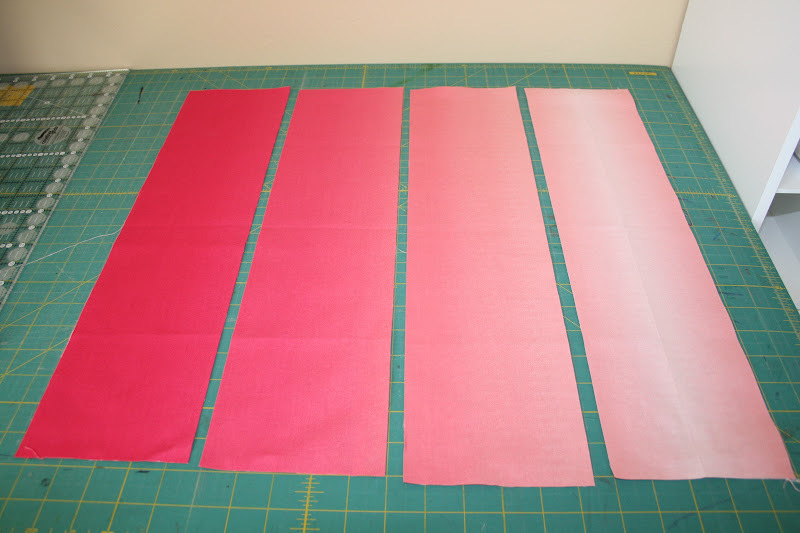 With the lightest color of fabric in the middle, cut another strip 4 3/4″ wide. 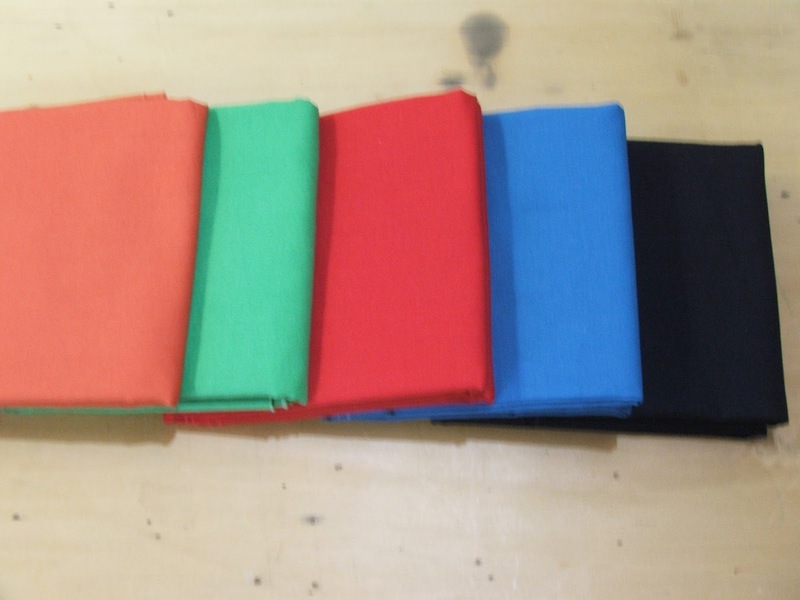 Using the fabric between the two strips you just cut, find the area of fabric with the biggest color difference. I eyeballed this and then cut two 4 3/4″ strips- one from each area. 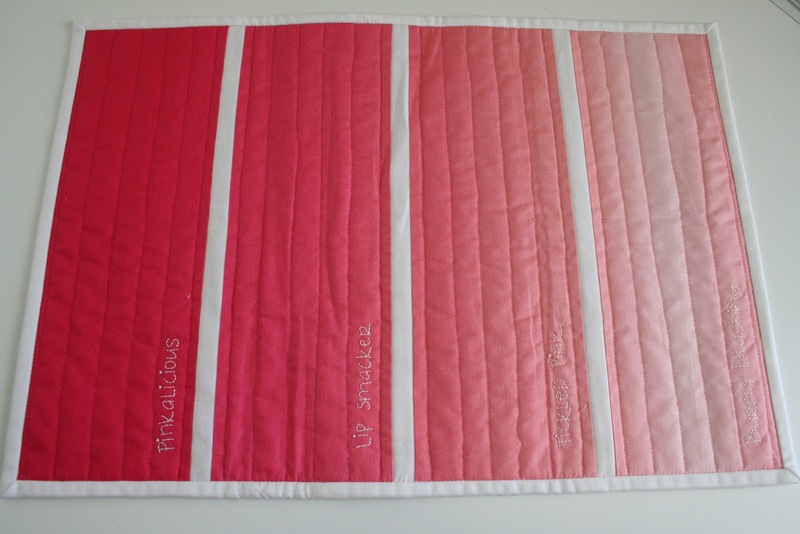 Trim each strip to 14″ in length then lay out your 4 strips in order from darkest to lightest. 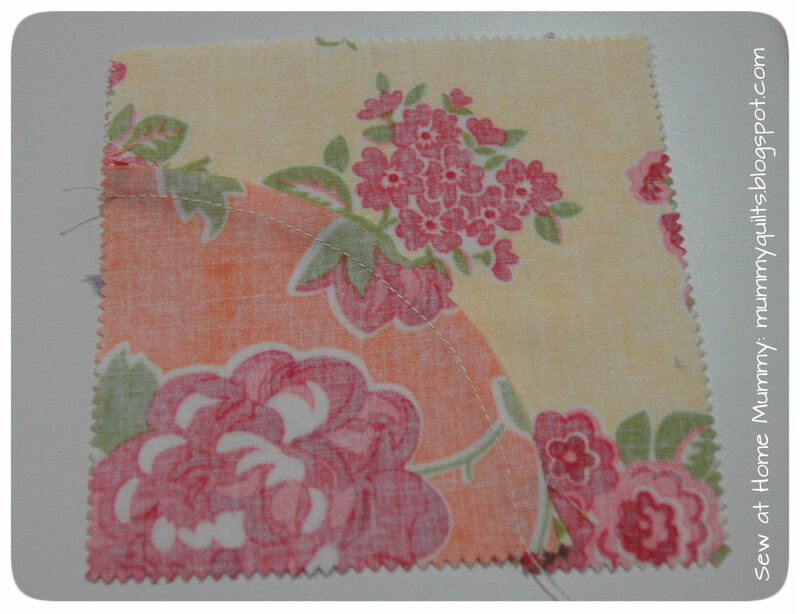 From the white fabric cut (2) 2 1/2″ x WOF strips and (1) 1″ x WOF strip. 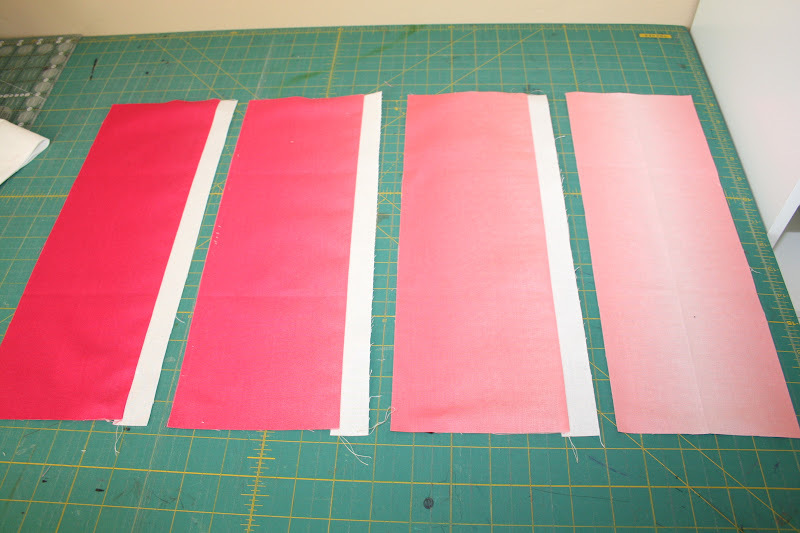 Begin sewing a 1″ white strip to the right side of 3 color sections as shown above. 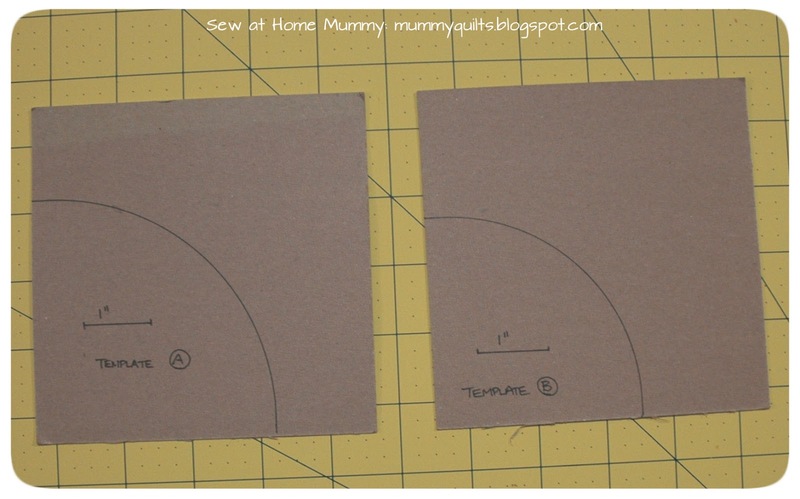 Use a 1/4″ seam. 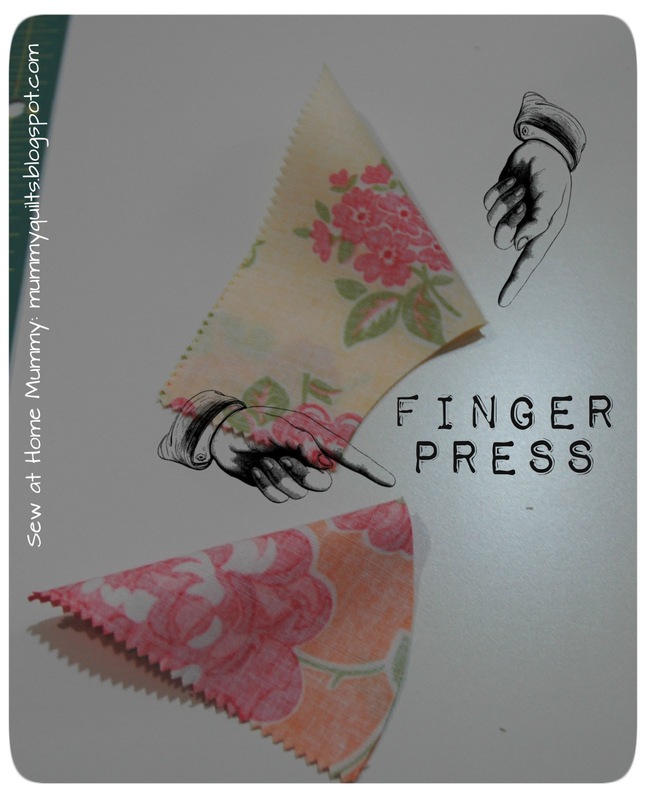 Press towards the Ombre fabric. Making sure the colors stay in order, continue sewing sections until all are together. 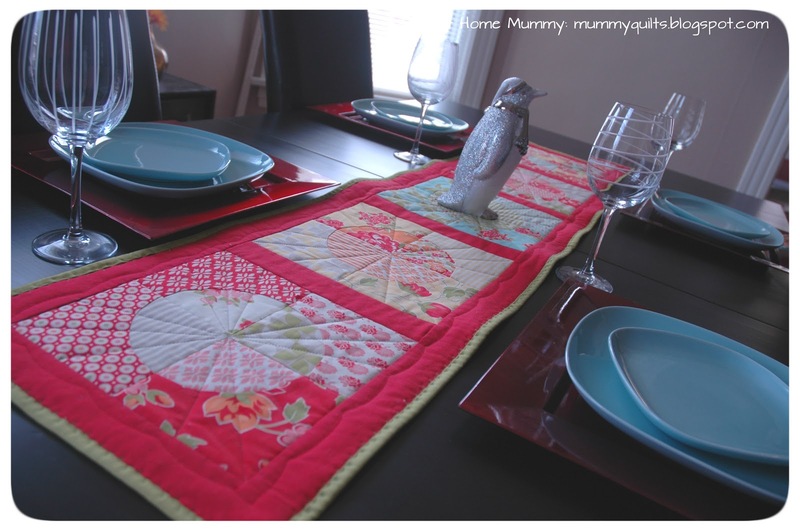 After the placemat top is together you can add “color names” if you want. 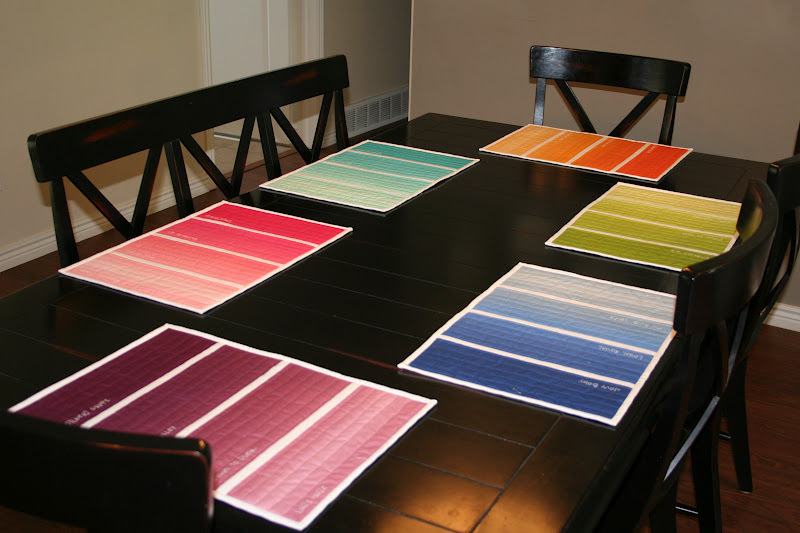 I designated a placemat for each member of my family and then chose color names that fit that person. 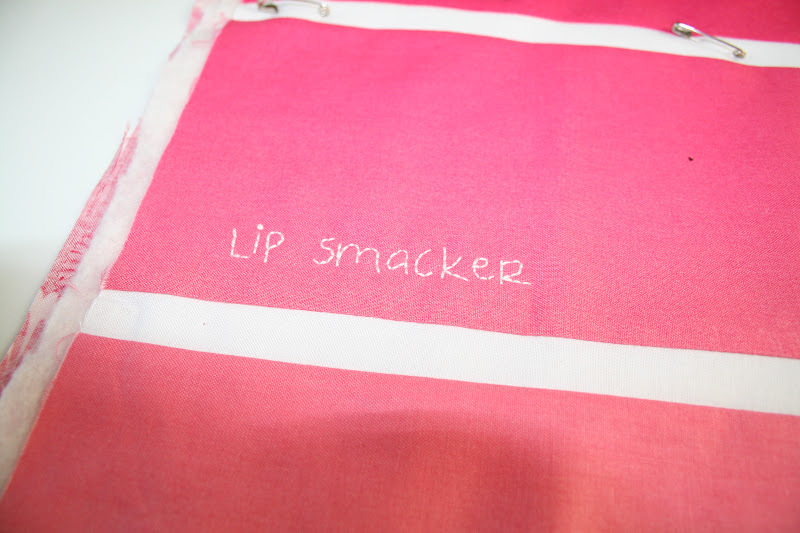 My daughter has the pink placemat so I used color names such as “Lip Smacker” and “Pinkalicious” to personalize it for her. Use your creativity or find color names online from a paint store. Write the names in the bottom left of each section using a Frixion pen (the kind that disappear when ironed). Layer with a 80/20 batting and embroider using a backstich and thread of your choice. 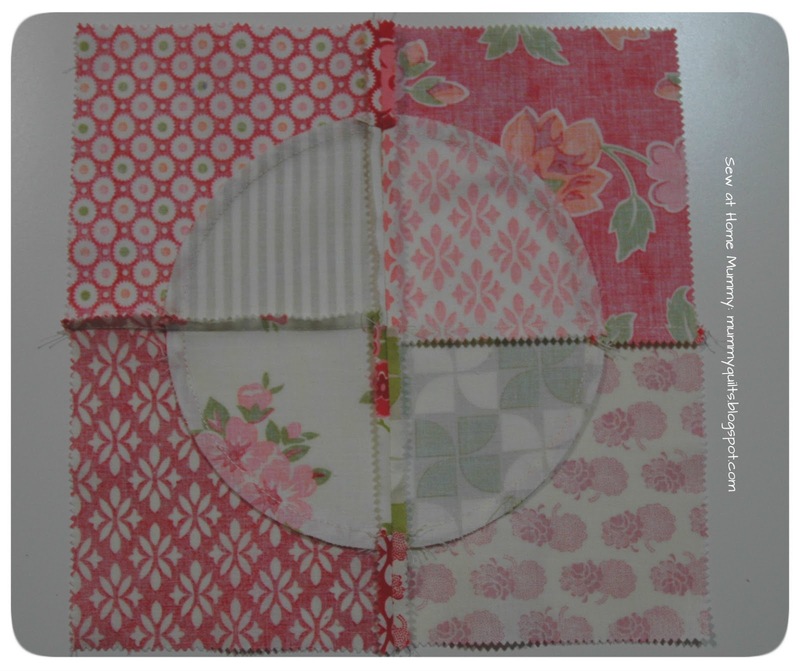 Finish the placemat by sandwiching the placemat top, 80/20 batting, and coordinating fat quarter for the back. Baste or pin then quilt. 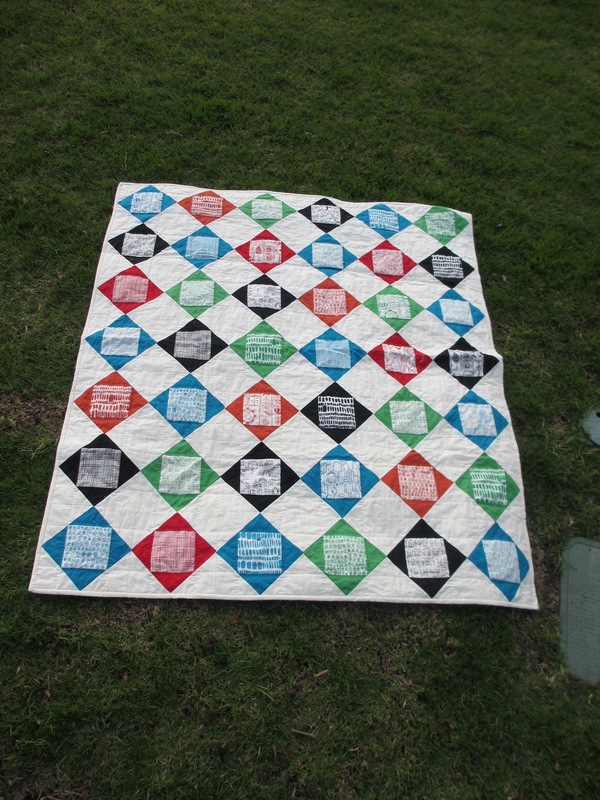 I used not-so-straight line quilting in each section. 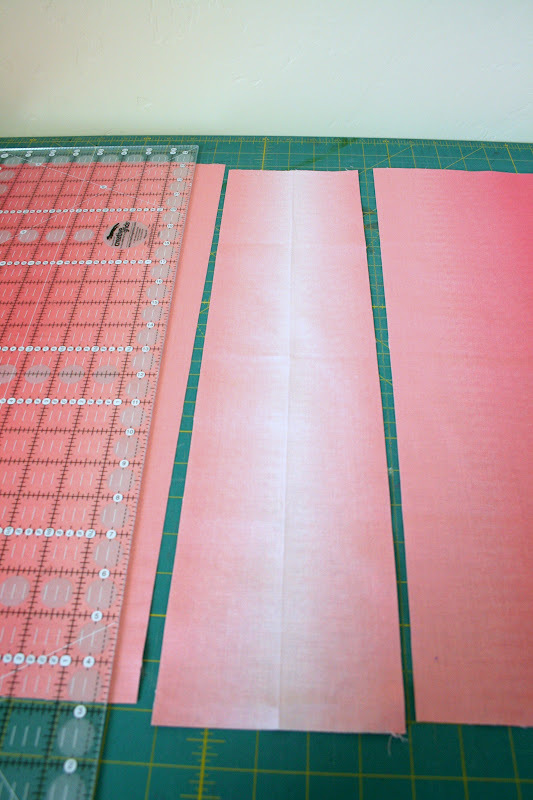 Bind using the 2 1/2″ strips cut earlier from the white fabric. Now you can go back and make one from each color!!! 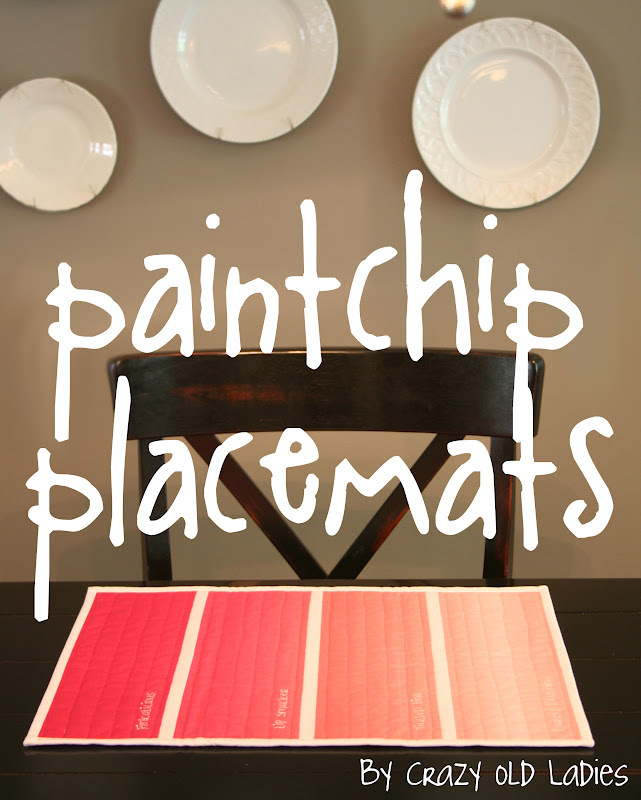 1 gorgeous Paint Chip Placemat! Thanks for joining me! 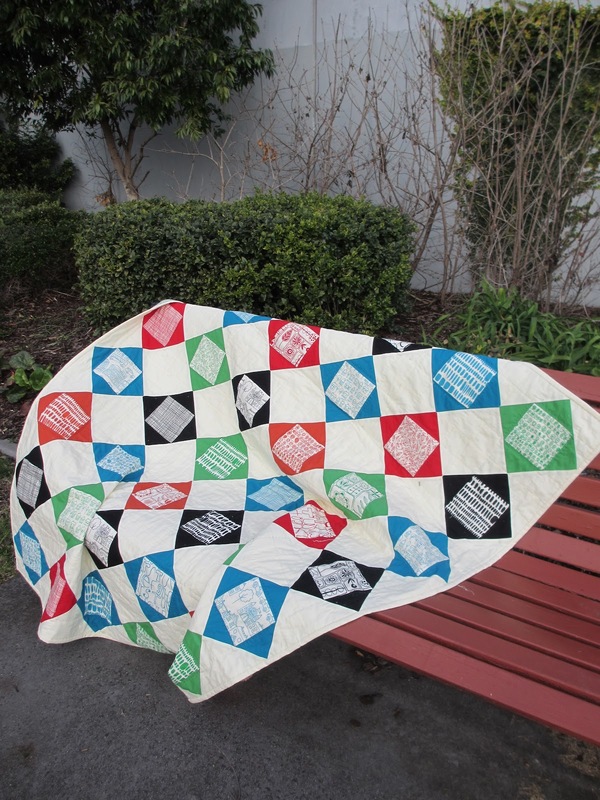 Don’t forget to come visit me on my blog: Crazy Old Ladies Quilts. Credit for inspiration of this fabulous project goes to Avril Loreti. Visit her Etsy shop to see her other amazing creations. Leave a comment Posted in Bella Solid, Crazy Old Ladies, Easy, Emily Herrick, Fat Quarter, Gifts, Home Decor, Simply Color, V and Co.
Hi, it’s Kristy here from Handmade Retro. You know how there are some times that you have the time and energy to work on something really involved and intricate and others where you just feel like a simple sew with very little cutting? This quilt is for those times like the second option. It is also a great option for simple graphic prints or novelty prints you don’t want to chop up too small. Cut 12 – 5.25″ strips and cross cut into 5.25″ squares. You will be able to get 7 squares from each strip – you will need 84 squares total. Cut each of the squares into triangles in half from corner to corner – you will end up with 168. 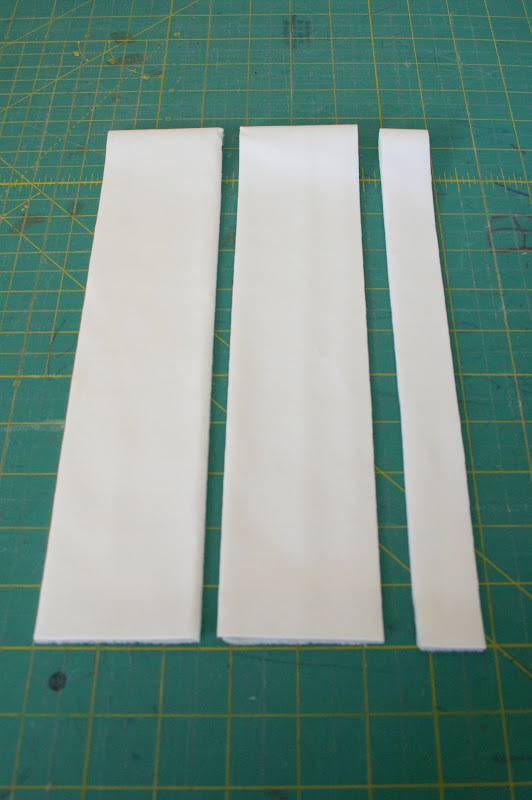 Cut 1 strip 4″ wide – cross cut into 10 4″ squares and then again into triangles in the same manner as the cream solid. You need to finish with 20 triangles. 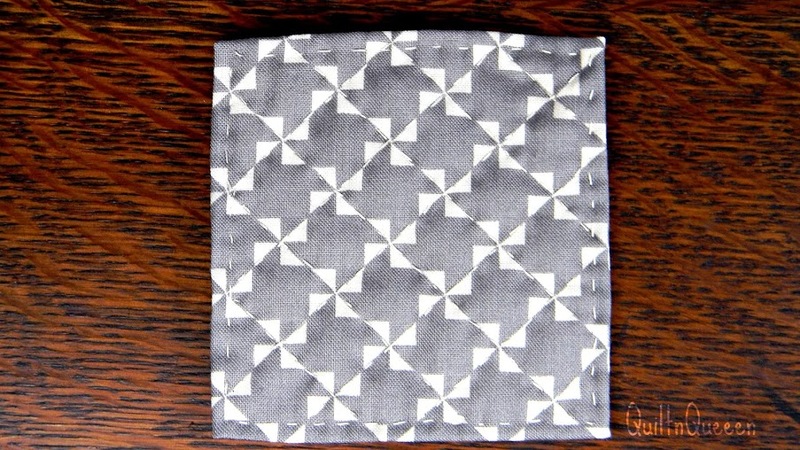 Cut 1 strip 4″ wide – cross cut into 10 4″ squares and then again into triangles in the same manner as the fabrics earlier. 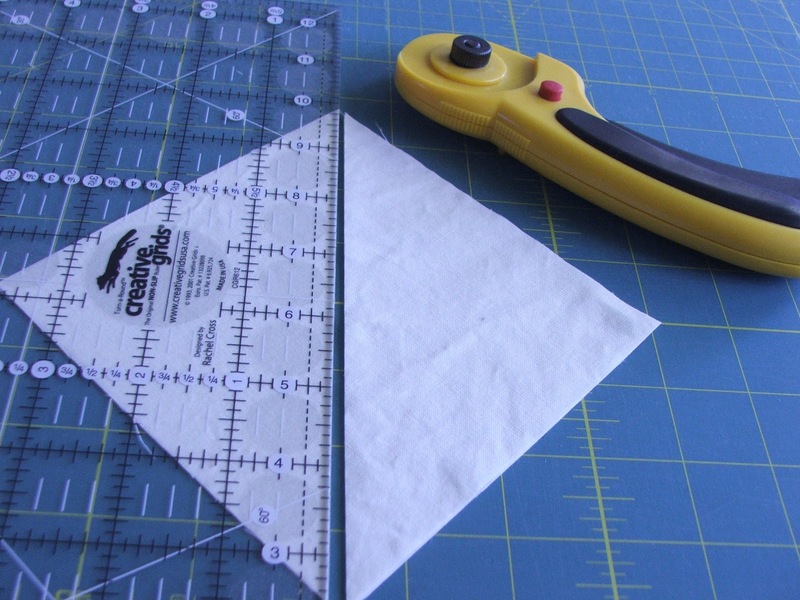 Cut 2 strips 4″ wide – cross cut into 18 4″ squares and then again into triangles in the same manner. You need to finish with 36 triangles. 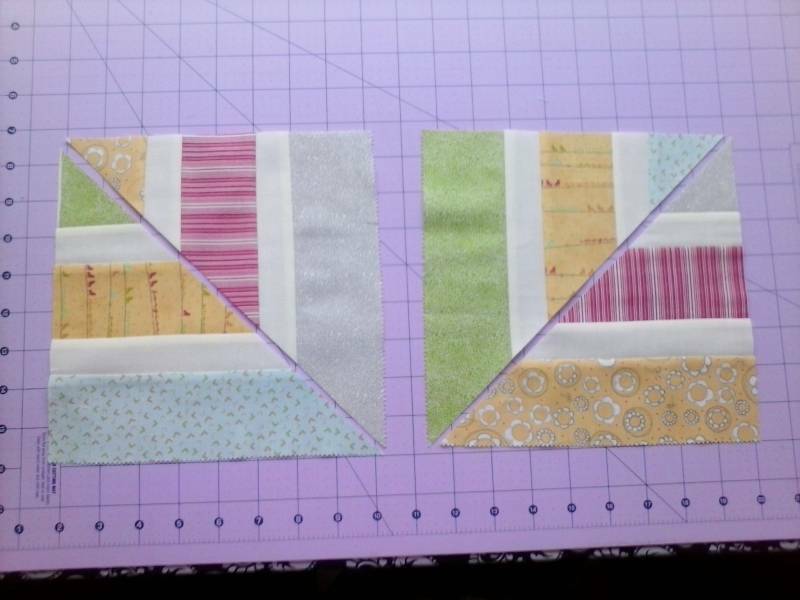 Cut 2 strips 4″ wide – cross cut into 20 4″ squares and then again into triangles in the same manner. You need to finish with 40 triangles. 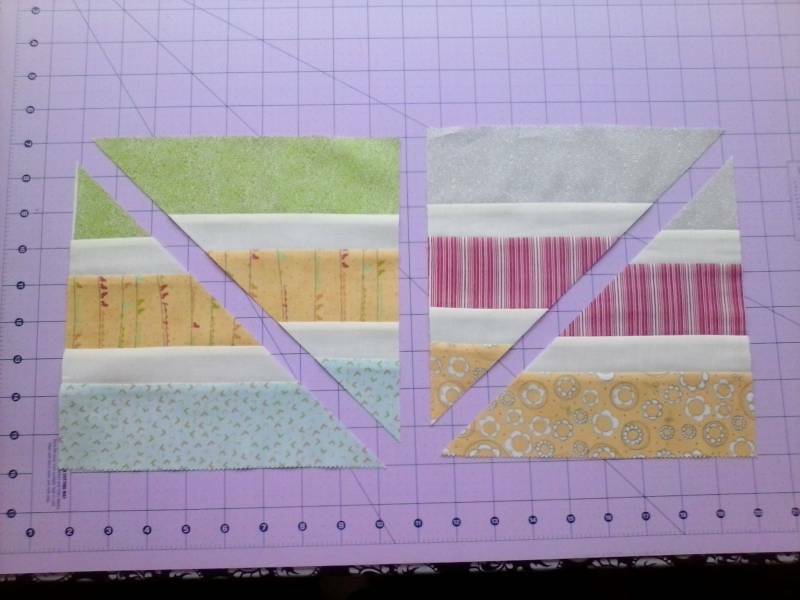 Cut 3 strips 4″ wide – cross cut into 26 4″ squares and then again into triangles in the same manner. You need to finish with 52 triangles. That’s it. All the cutting is done. 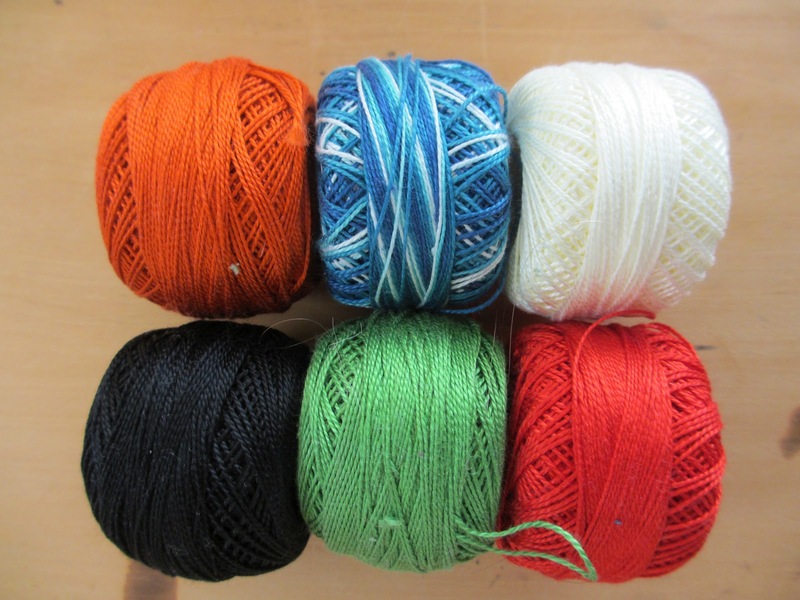 Split your bundle into color families – in Summersville you will have 5 (from left to right – black, red, blue, green, orange). All the blocks will be constructed in the same way – just with the matching solid. 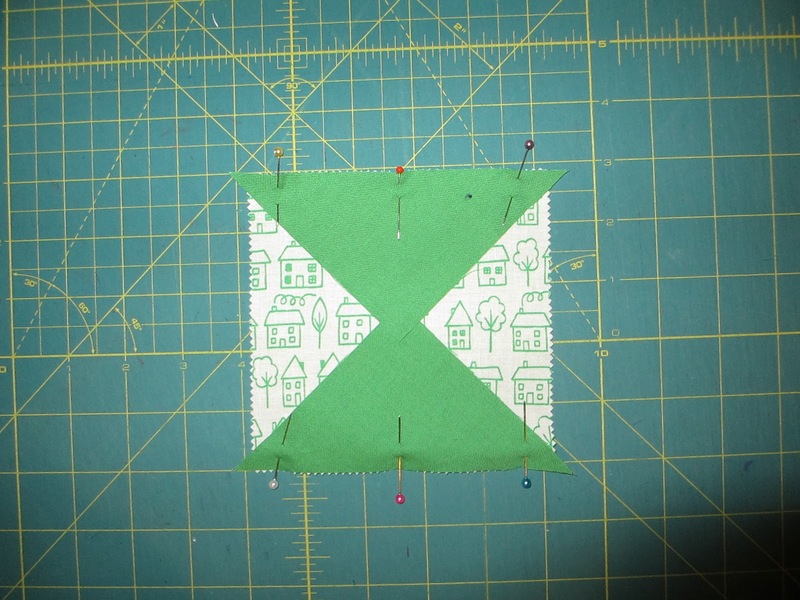 Find the center of two opposite sides of a charm square and finger press to mark. Take two corresponding color triangles and find the center on the long side in the same way. Match the center marks and pin at the center mark and each end, you will have some overhang on each end. That’s a good thing. 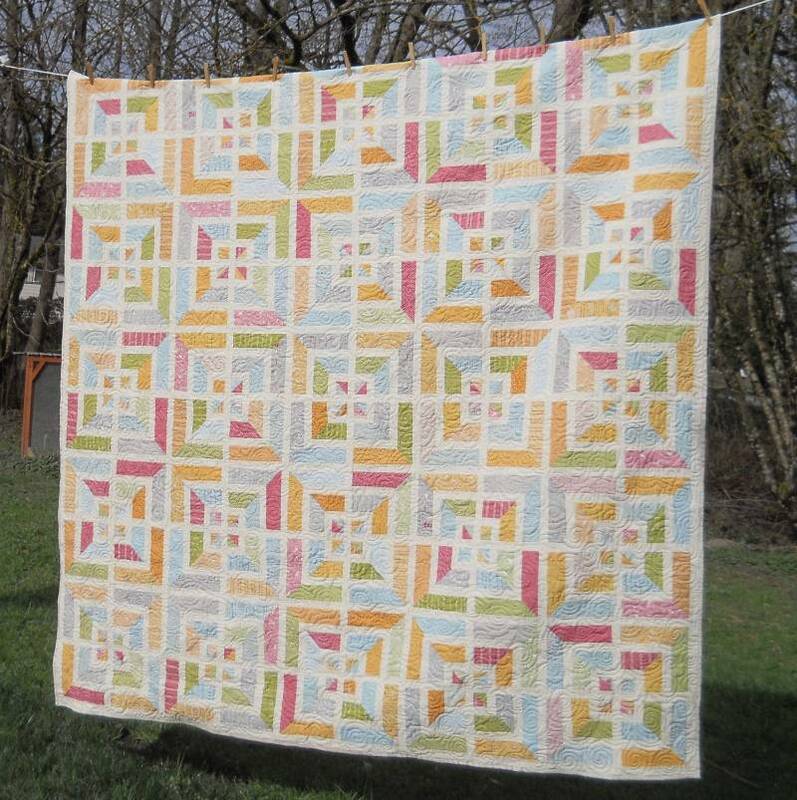 Tip: I worked with one color at a time, pinning the triangles onto opposite side of all the squares of one color and then chain piecing them down one side and then the other. Press the triangles open to end up with something like this. I recommend pressing your seams towards the triangle. Find the center of the two sides without a triangle and finder press to mark. Do the same with the rest of the triangles and pin. Sew, chain piecing as before. Press triangle out – you’ve got a square again! Trim the dog ears from the center of each of the four sides. 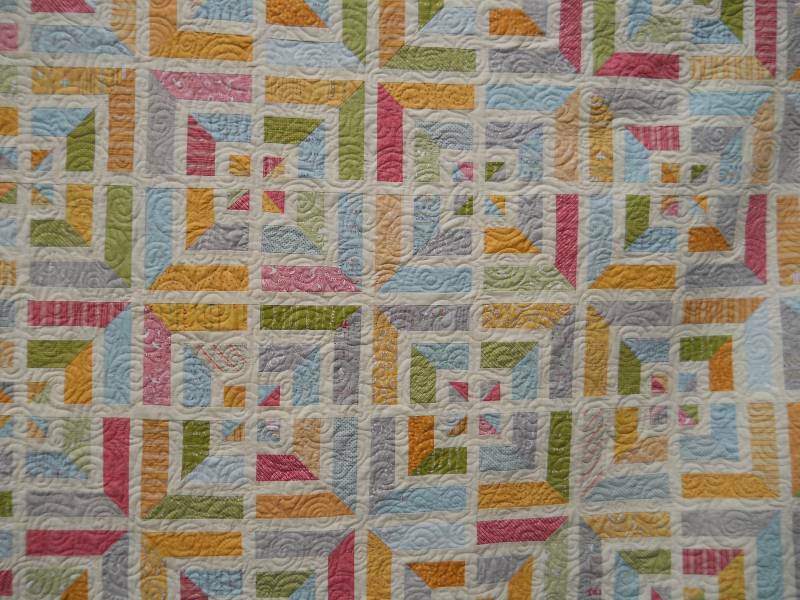 The cream triangles are added in exactly the same way – the only difference is I only mark the center on the triangle – I match this with the point of the charm square – this is not the edge of the seam on the edge of the block! 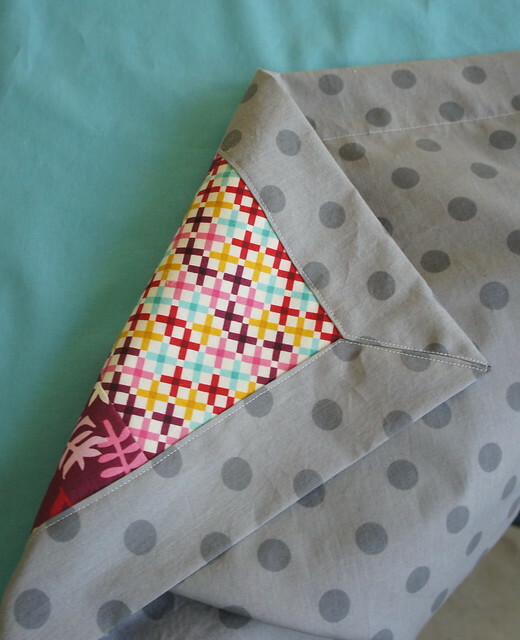 Sew a triangle on opposite sides, press out, repeat with the remaining sides. Trim the new dog ears. Lay out your blocks until you are happy with the distribution of the colours. You should have 42 blocks for a 6×7 layout. 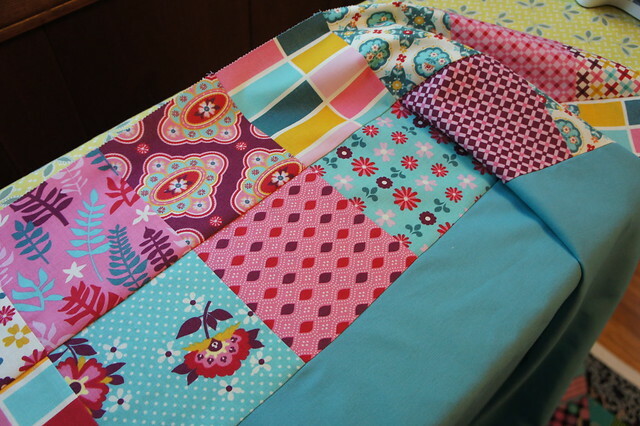 When you are satisfied ,sew the blocks together in rows, then pairs, then fours, then join and add on the last row nesting seams between the blocks and pressing row seams towards the bottom of the quilt. 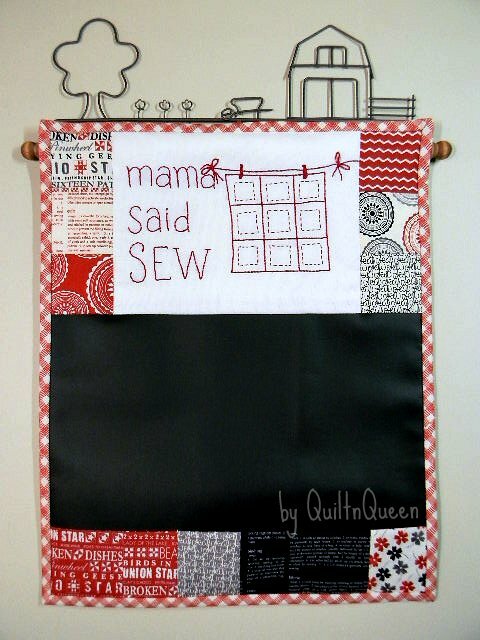 You have a quilt top! 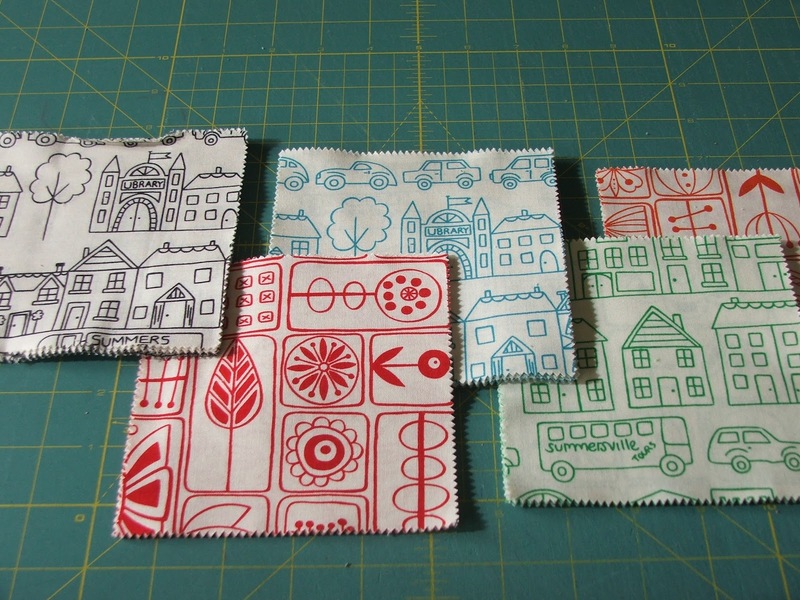 I pin baste my quilts. First I tape the backing to the floor pulling tight (but not stretching the fabric) and taping the edges flat. Tip: If you have joins or designs you want to match up the floorboards joints or tile grout lines can be helpful here! 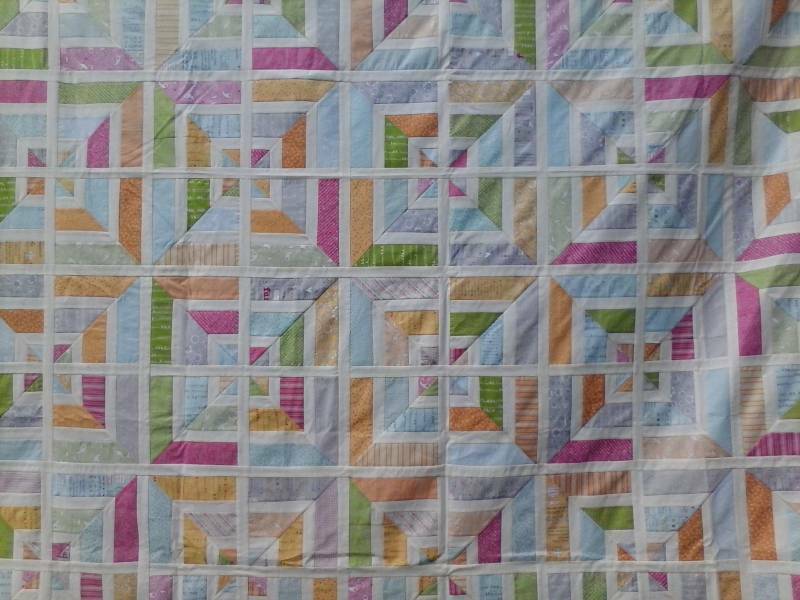 For this quilt I hand quilted with Perle cotton No. 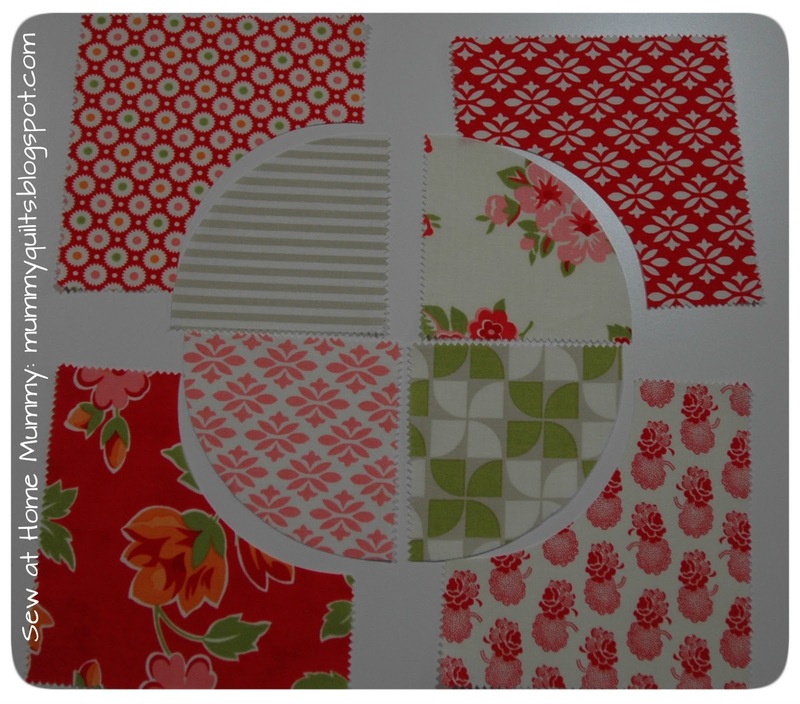 5 (see garnishes for colors I used) ¼” outside the print square and in a square inside the larger cream areas. 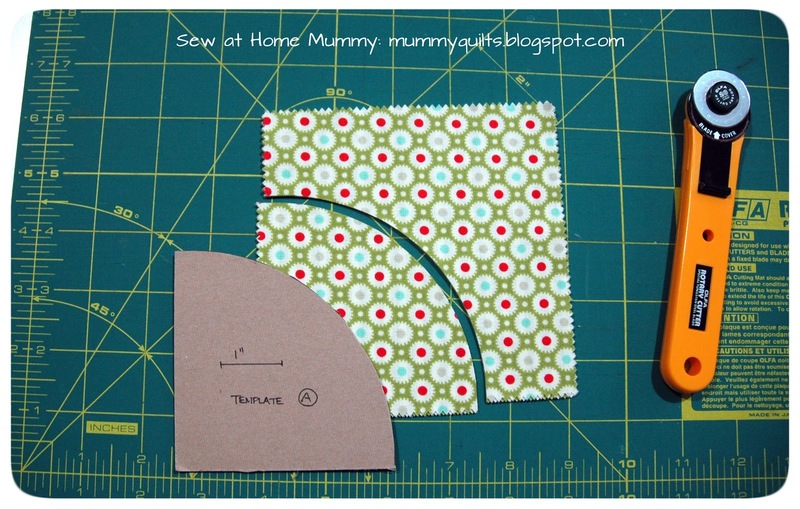 I use straight of grain binding, machine sew to the front, mitering corners and hand stitched to the back. Hello everyone! 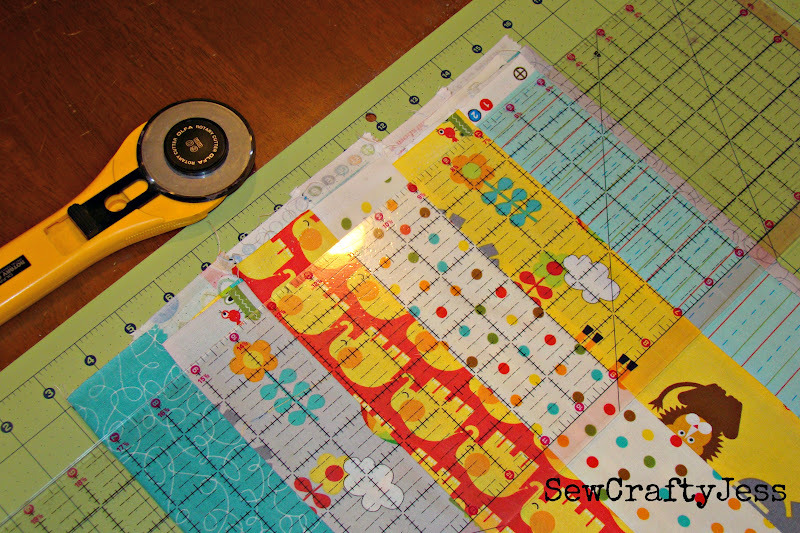 My name is Jessica and I blog at SewCraftyJess. I am so excited to share my very first Moda Bake Shop tutorial with you today. 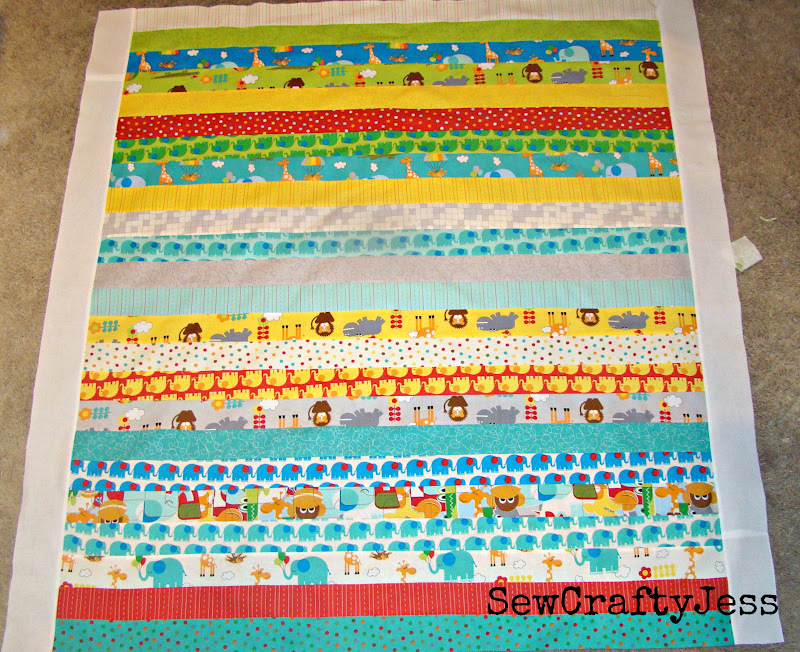 It seems I am often needing to make baby quilts for different friends and families new additions, so I am always on the lookout for adorable kiddo fabrics. 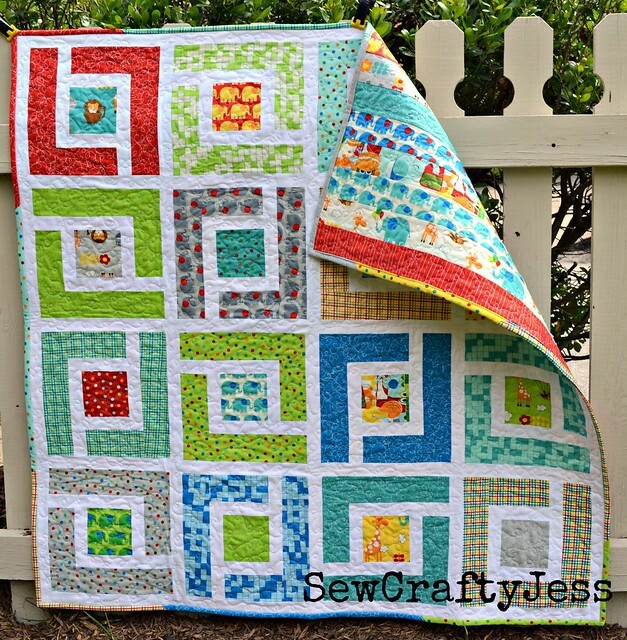 When I came across Bungle Jungle by Tim and Beck, I just had to put together a baby quilt showcasing all of the adorable prints in such fun colors, and I’m excited to share it with you today! 4. 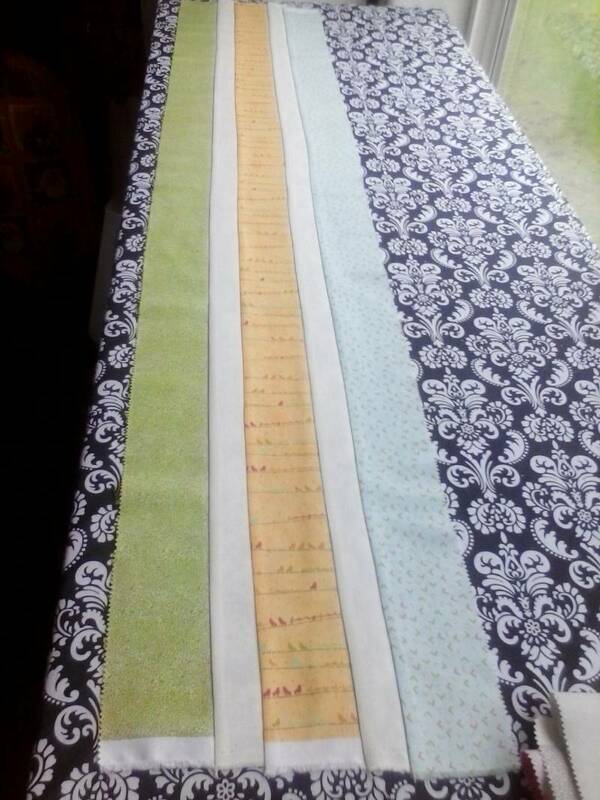 From each jelly roll strip, cut (2) 10″ strips from the selvedge edges. 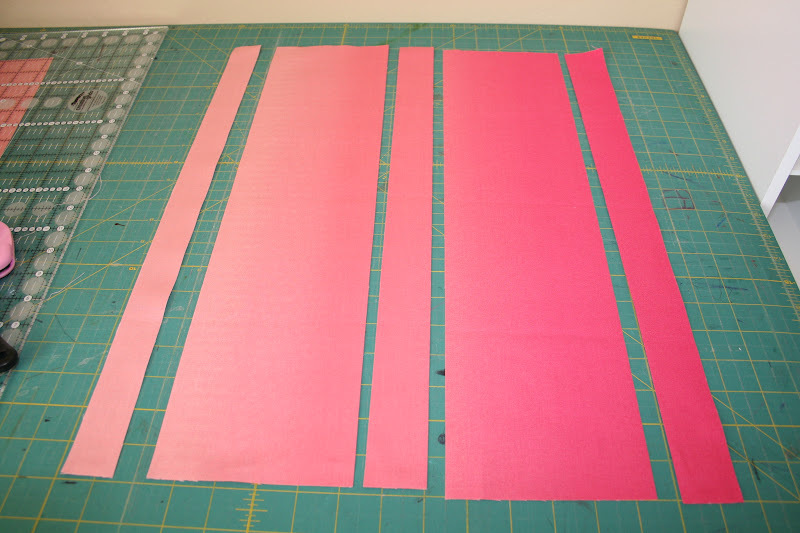 We will be using the remaining ~20″ of jelly roll strip for the binding, set aside. 5. 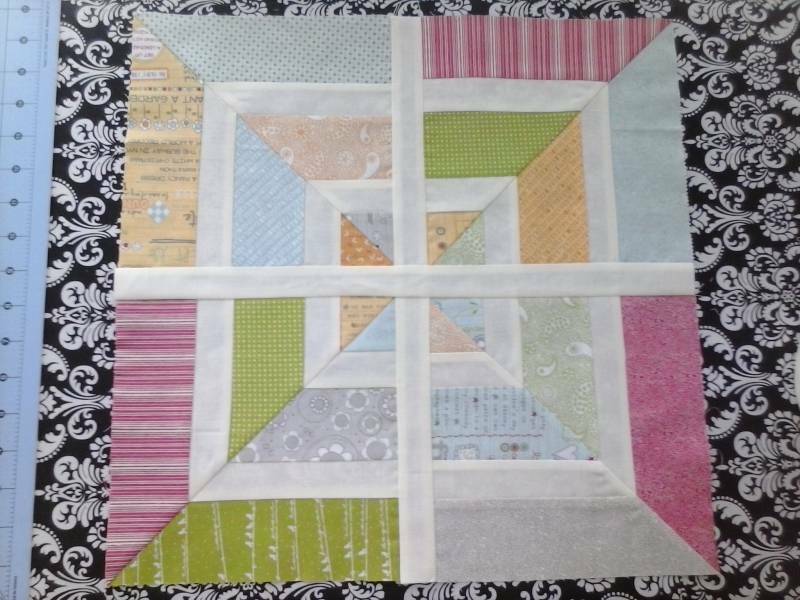 Take your center square bordered in white and sew (2) matching 6″ x 2.5″ pieced strips from step 4 onto opposite sides, taking care to align the white portion of the strip to the left on one edge and to the right on the other. 6. 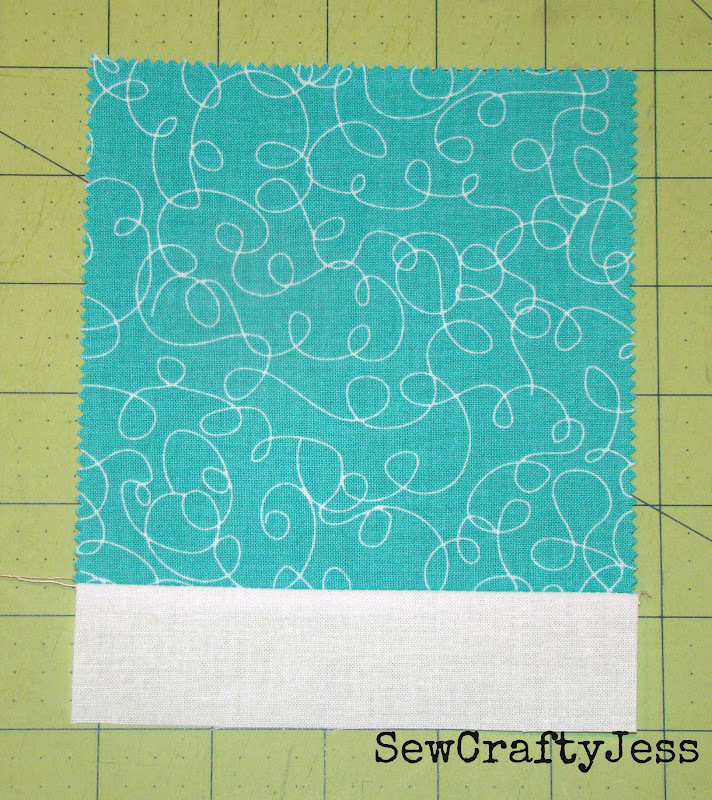 Sew (2) matching 10″ jelly roll strips on to remaining sides of center square bordered in white. 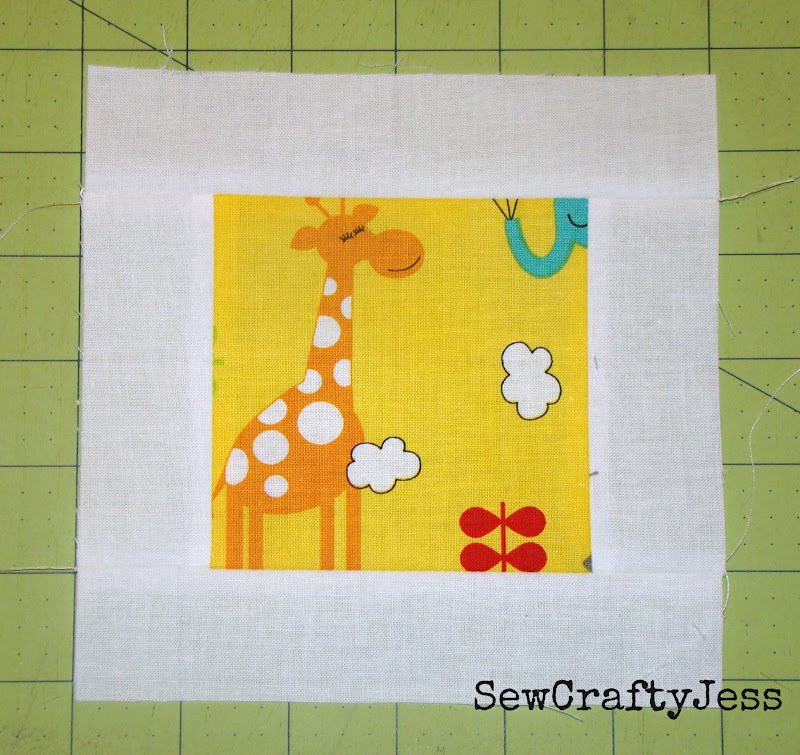 Your block should now measure 10″ square. 7. 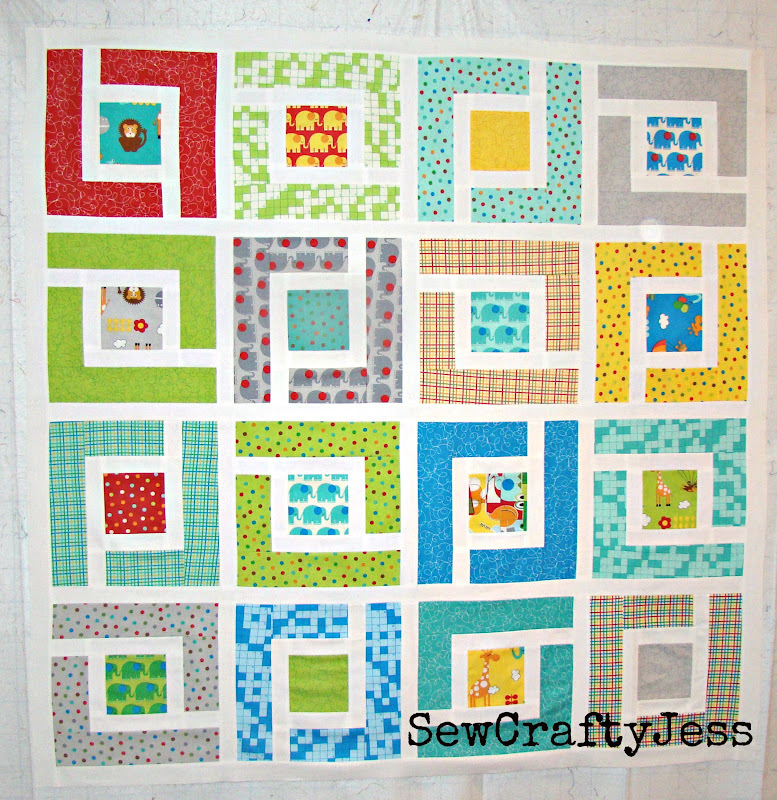 Repeat to sew 16 blocks. 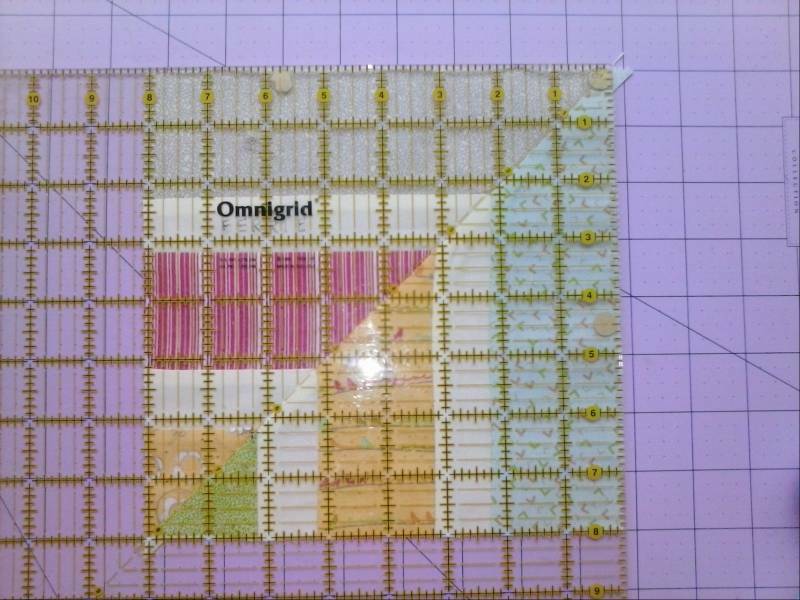 Arrange your layout taking care to alternate the direction of the white strips between vertical and horizontal. 8. 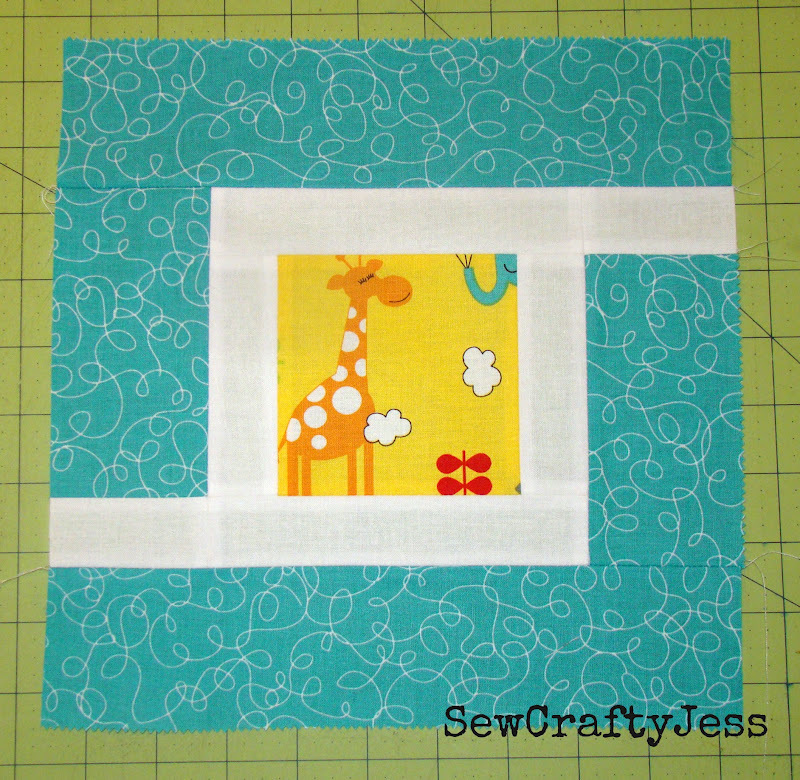 Attach blocks by sewing (1) 10″ x 1.5″ white sashing strip between each block. 9. 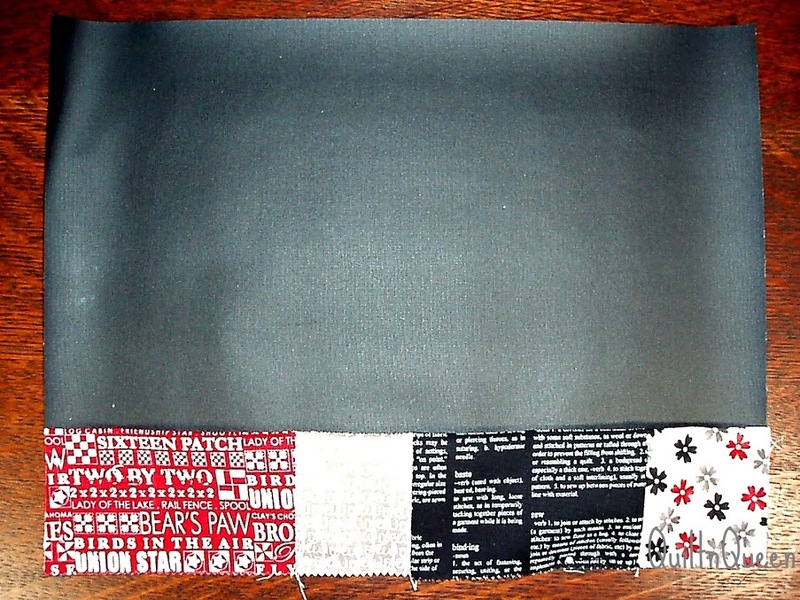 Attach rows by sewing (1) 41.5″ x 1.5″ white sashing strip between each row, and one sashing row on top of the top row, and one sashing row on bottom of the bottom row. 10. 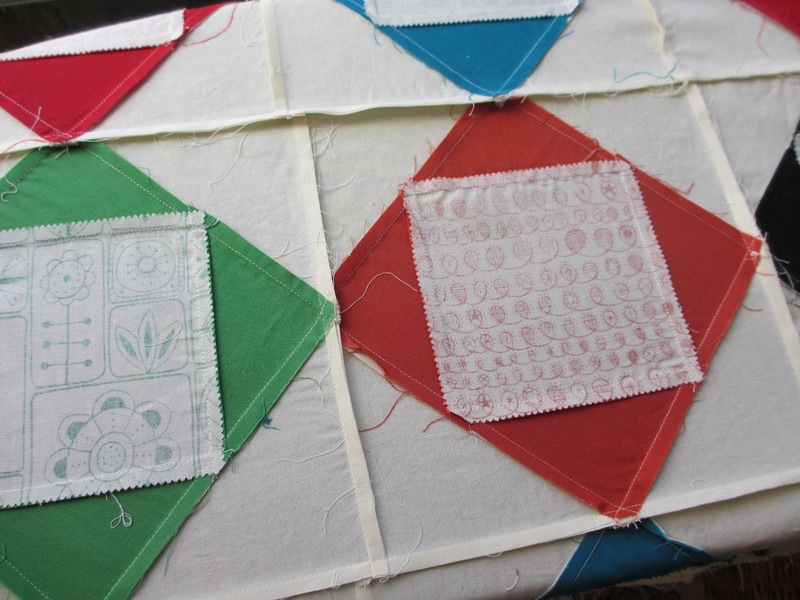 Attach last two rows of sashing to the left and right borders of the quilt top. 2. 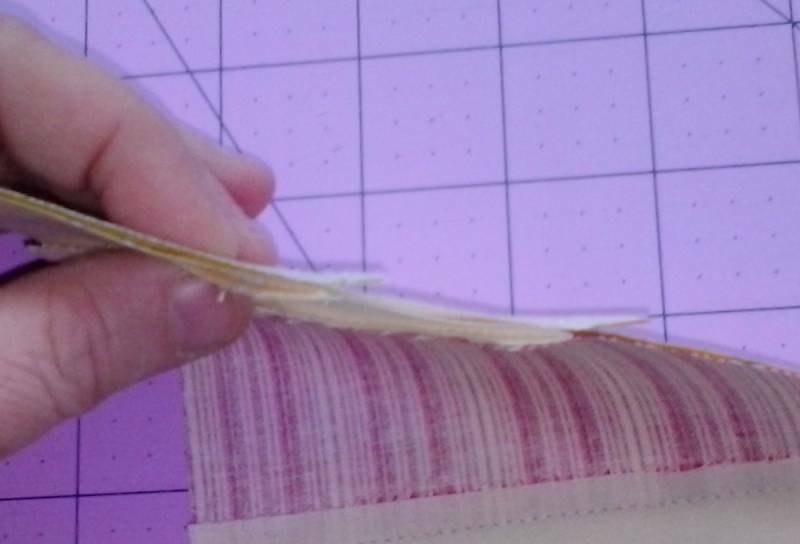 Trim the selvedges off your strip pieced square. 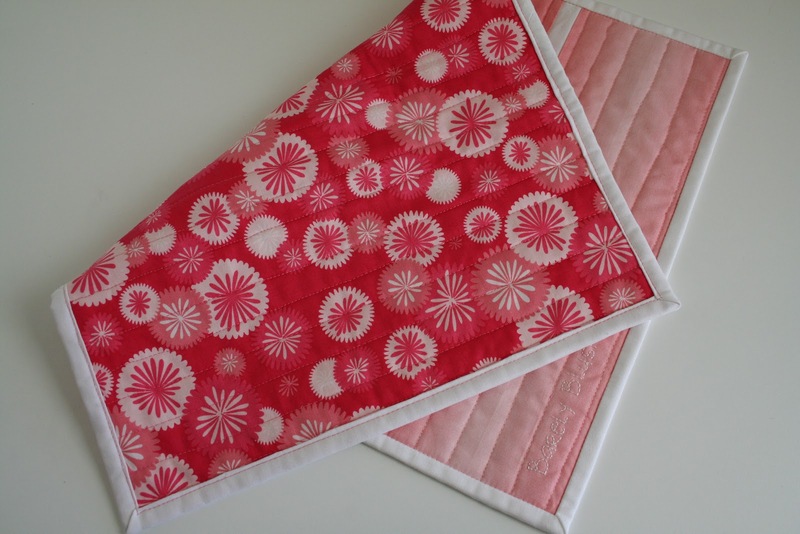 To make binding, choose 10 leftover jelly roll strips from cutting the 10″ strips for your blocks. 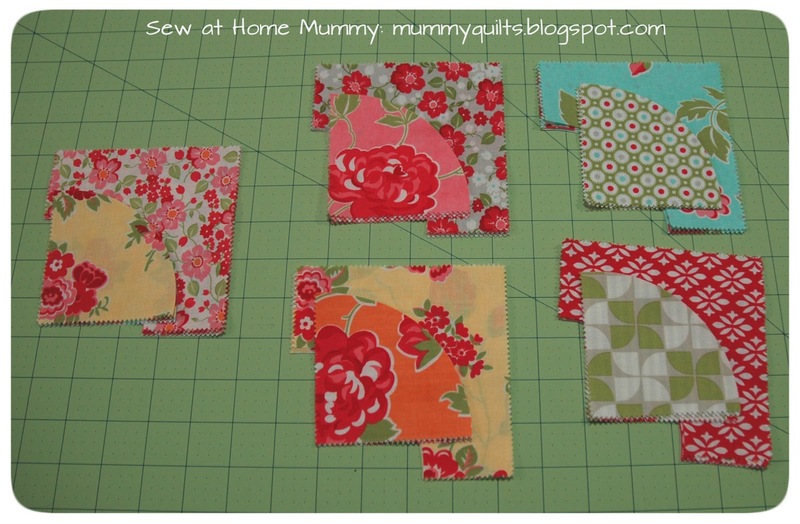 Sew together to form scrappy binding. 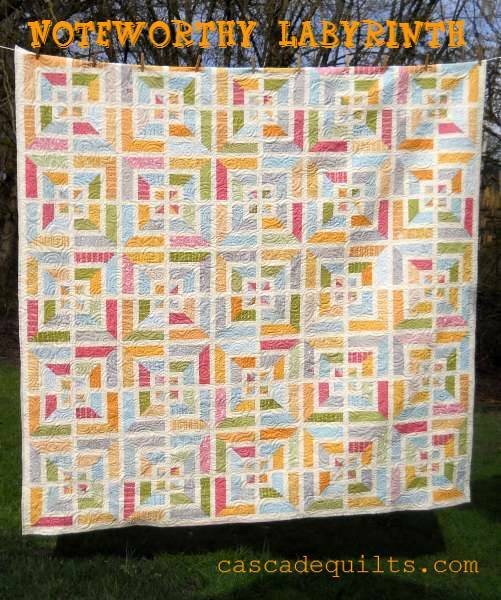 One 43″ x 43″ reversible baby quilt, ready to be loved and snuggled! 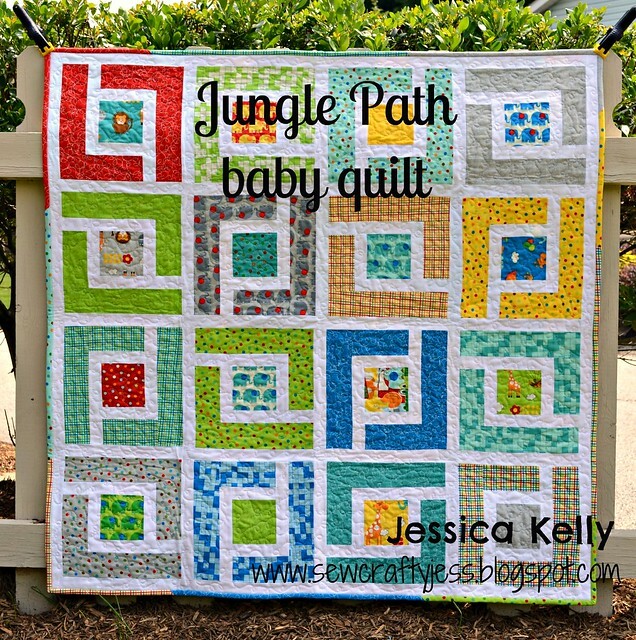 If you use this tutorial to make a Jungle Path baby quilt, I’d love to see it! 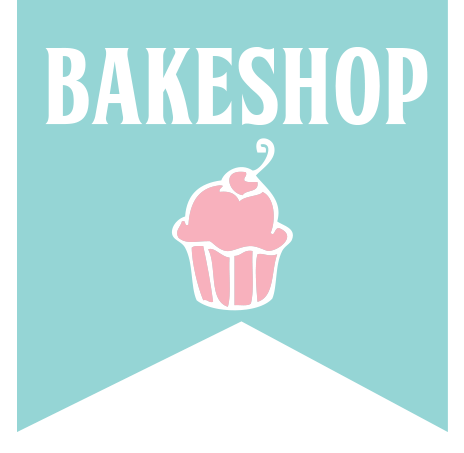 Be sure to add it to my Flickr group, and of course to the Moda Bake Shop Flickr group as well. 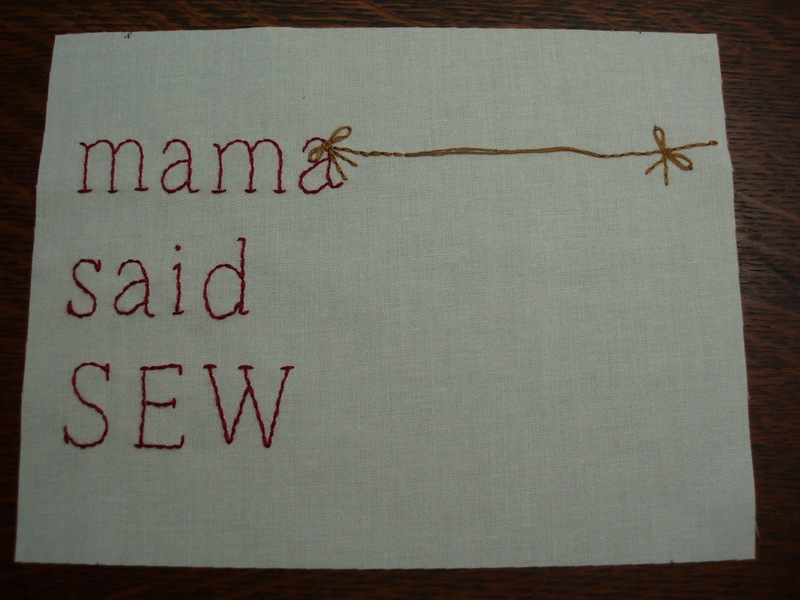 Thanks for stitching along! Hello All! My name is Angela and I blog over at Cuttopieces.blogspot.com. I’m back with another tutorial for you, this time using the lovely Domestic Bliss line by Liz Scott. I fell in love with these fabrics as soon as I saw them and wanted to make something quick and “easy” with all of the colors. 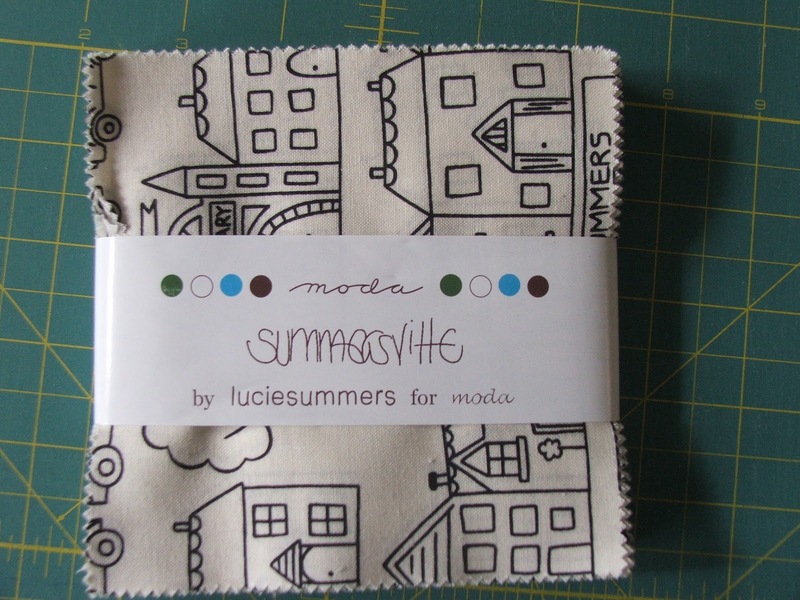 Sometimes you love every single fabric in a line and just want to USE them. Right now! 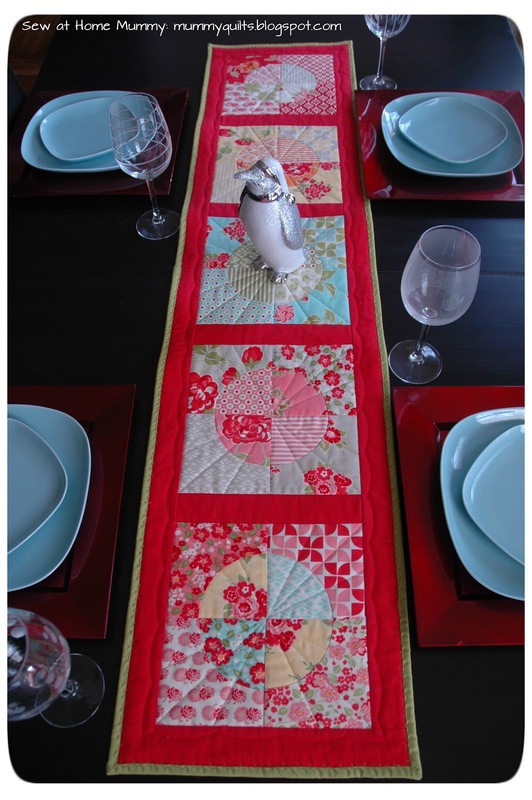 Well this tablecloth pattern will let you do that and gives you a very functional item along with the joy of diving into a collection. It uses just 2 charm packs. So there is enough to have some fun but not so much that it gets overwhelming. 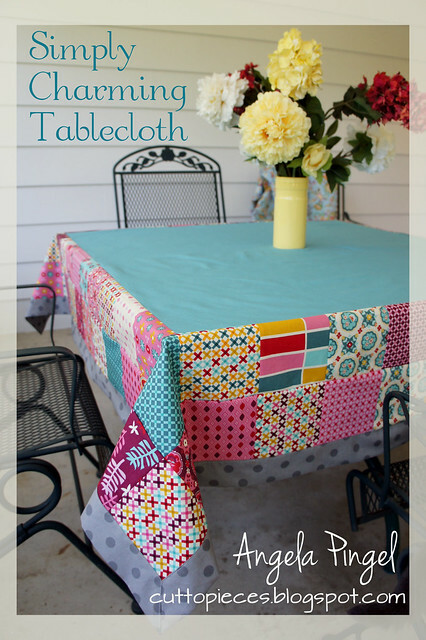 This tablecloth is perfect for special occasions like birthdays or holidays (with the right fabrics!) but is also simple enough for every day use. There are special details like a mitered edge border and a single piece backing. *update – not on PDF instructions* – you need 88 charms total…some lines will have enough in two charm packs. If you don’t have enough, I would take some of the extra Bella solid and cut it into charm squares and use them as corner squares on the table cloth. 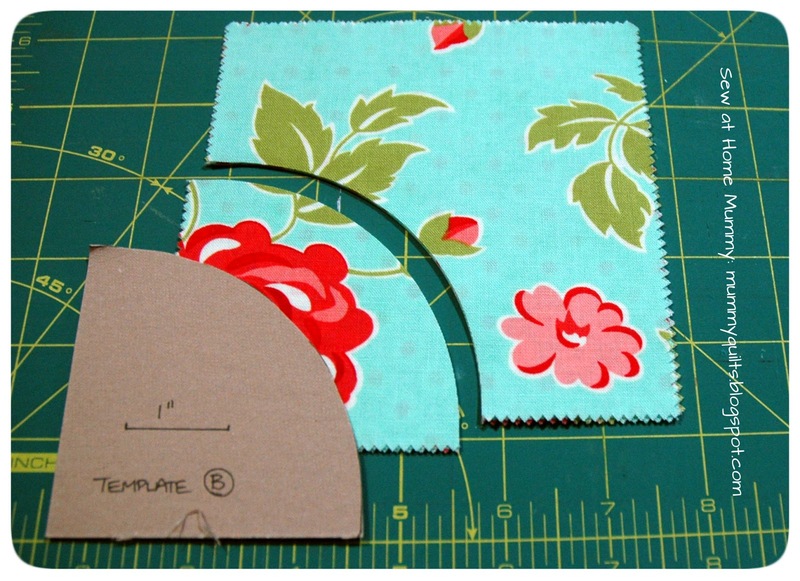 Cut the Bella solid into a 40 1/2″ square piece of fabric. Arrange your charms around the Solid center in rows. Sew the charms into rows and attach the rows to the solid center as shown below. First attach each 9 piece strip to opposite sides of the solid center. 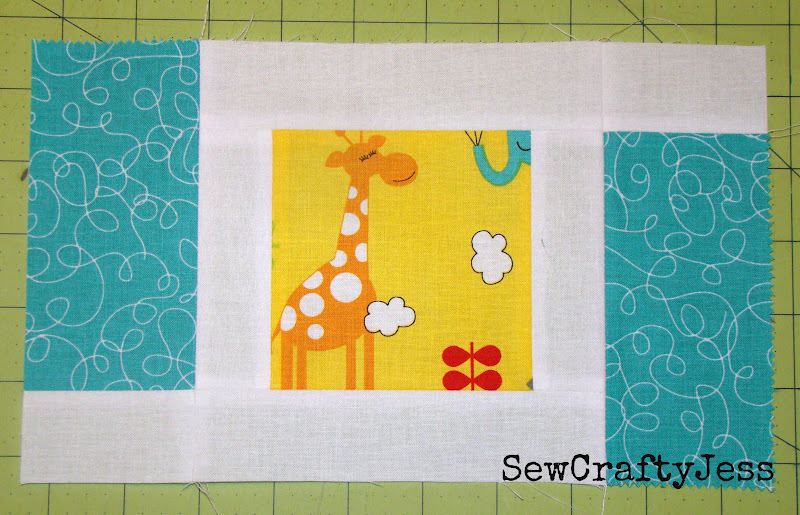 Next attach an 11 piece strip to the two remaining opposite sides of the solid center to create a square piece again. 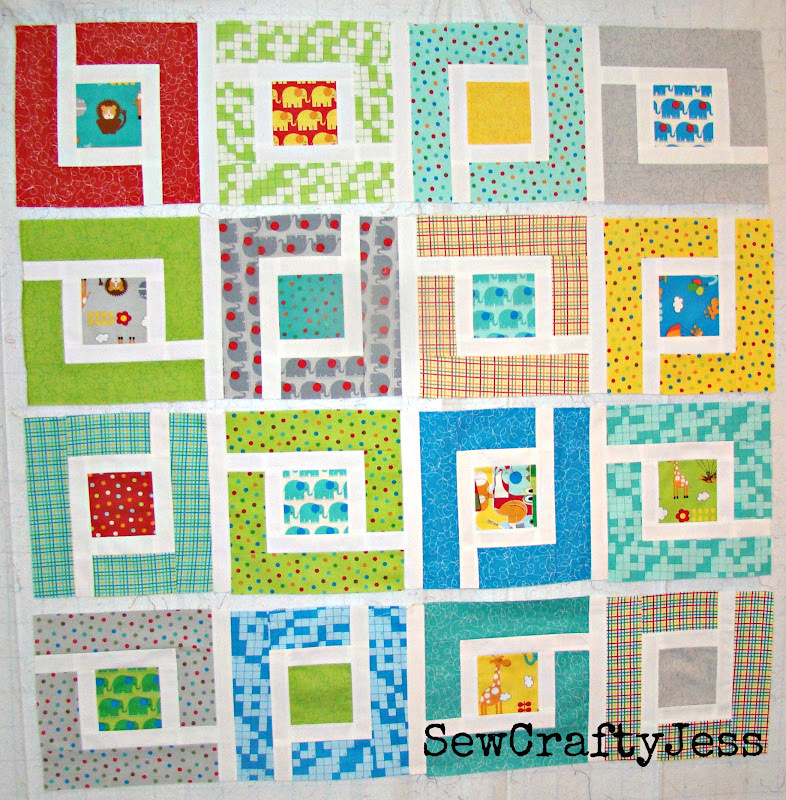 Then attach an 11 piece strip to opposite sides of the new square piece. Finally, attach a 13 piece strip to the remaining two opposite sides to once again square up the piece. Your piece should now be 58″ square. 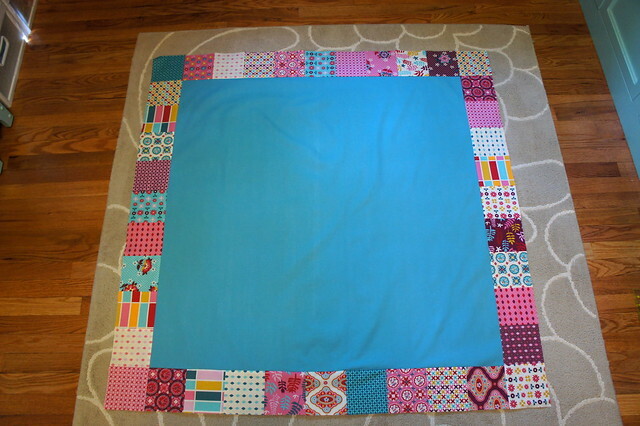 Cut the Dottie Backing into a 67″ square piece. We will be creating a deep mitered hem around the perimeter of the tablecloth. 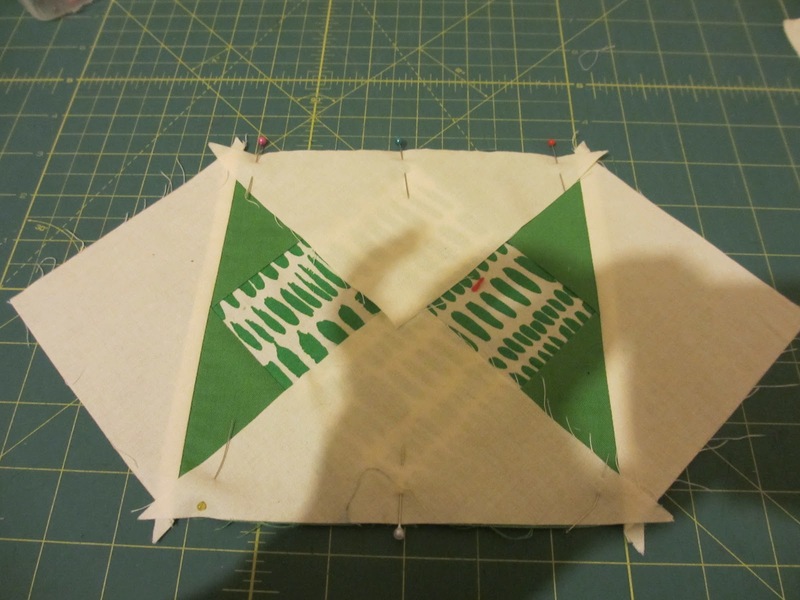 On all four sides of the backing fabric, press the ends wrong sides together with a 1/2″ fold. Follow this by pressing all four sides in with a 2″ fold. 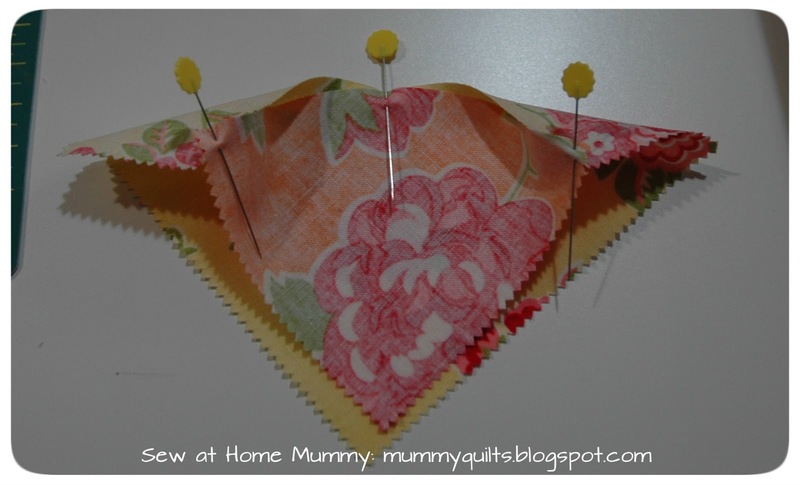 At each corner, unfold the fabric back to reveal the wrong side of the fabric. 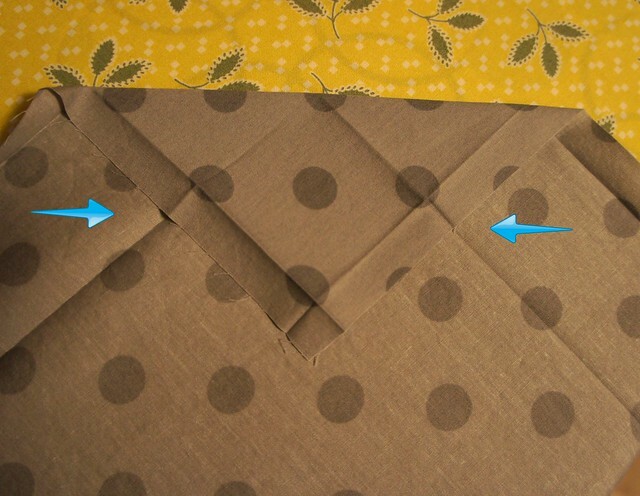 Fold each corner in at a 45 degree diagonal, wrong sides together. You should be able to match up your pressed creases. 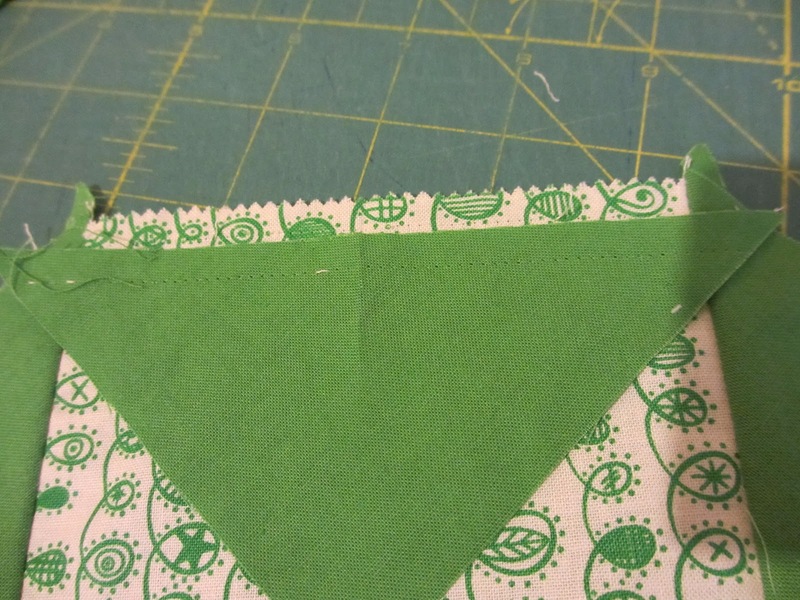 Trim the folded triangle to a 1/2″. Refold the fabric back along the original pressed edges to reveal a perfect mitered corner. Lay the backing fabric out with the wrong side up. Place the tablecloth pieced top on top of the backing, centering it. 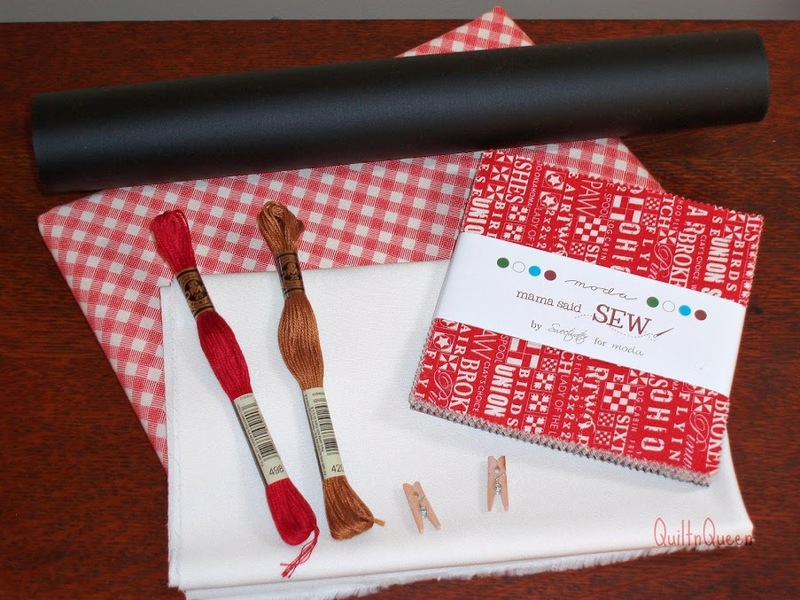 Keep each fabric as smooth and flat as possible. 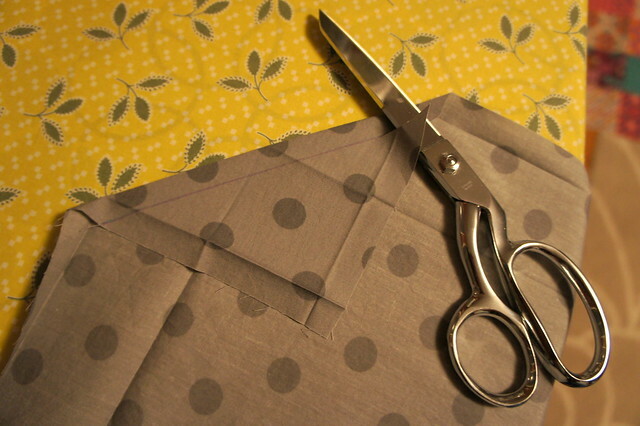 Fold the hem along the edge of the pieced top and pin in place around the entire tablecloth. Top stitch around the entire edge of the hem, including the mitered edges. And ta-da! You are done! Easy peasy! 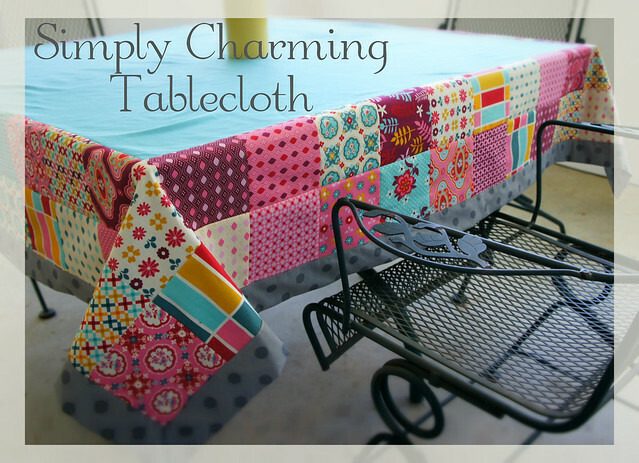 If you do use the tutorial to make a tablecloth I would love to see it! So please share it in my flickr group, Cut To Pieces and of course the Moda BakeShop Group as well. Enjoy!